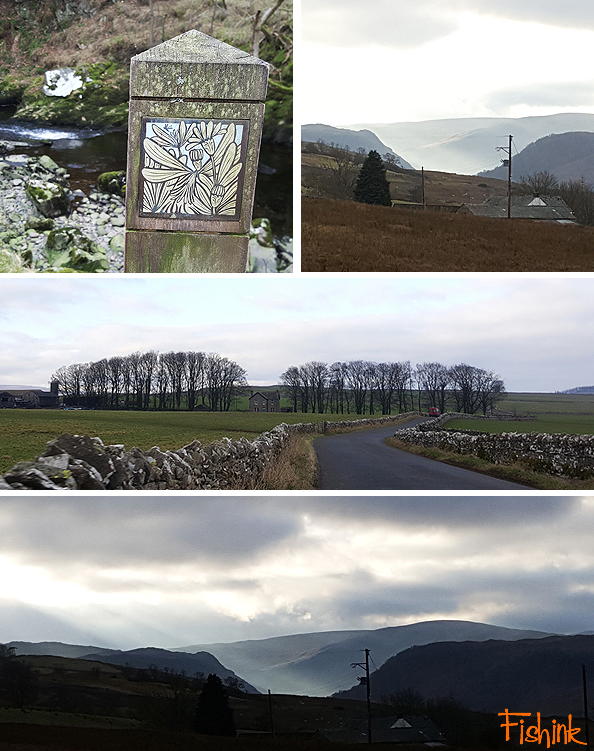 Welcome to part 2 of my travels around Scotland during New Year. 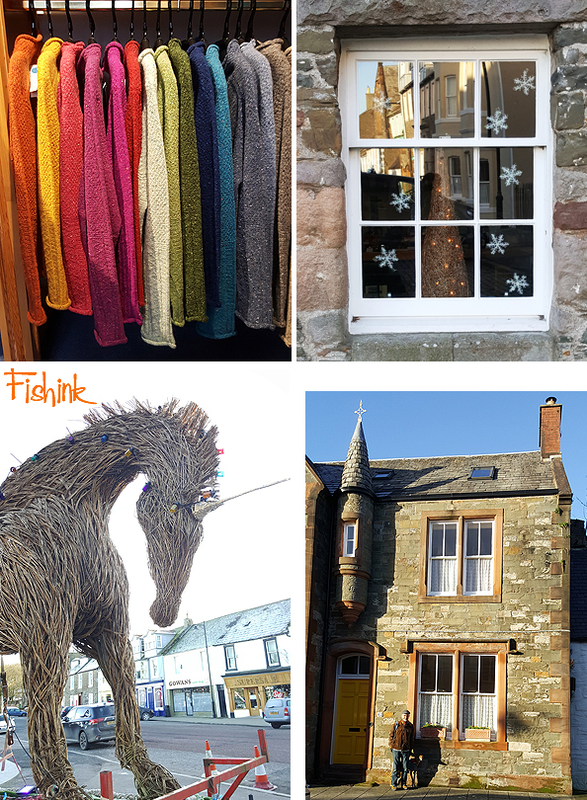 We start at the artists town of Kirkcudbright (pronounced Kir-coo-bree). 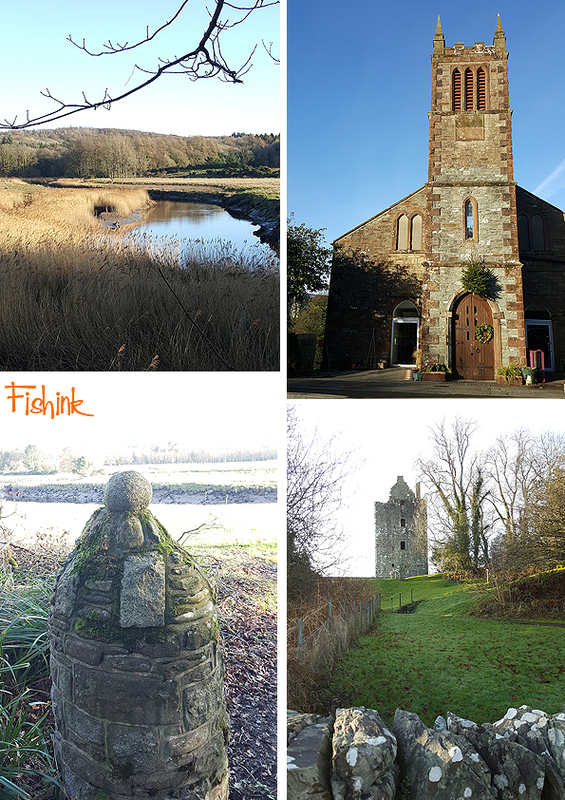 This has been a thriving community of artists predominantly between 1850 and 1950, It is said that it was the quality of the light that brought painters to Kirkcudbright. However, there can be no doubt that a strong attraction would also have been being part of a close-knit colony of artists, all working together at the pursuit they all lived for. 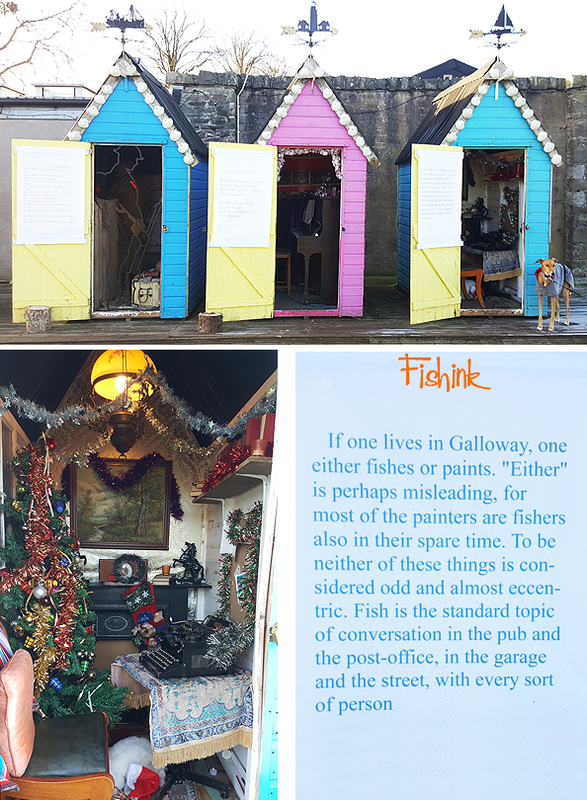 That’s also hinted at, from one of the pieces of prose I discovered on the door of these colourful sheds. Even in the local knitwear shop, there’s a keen eye for colour, texture and display. The town has some fabulous buildings and views. 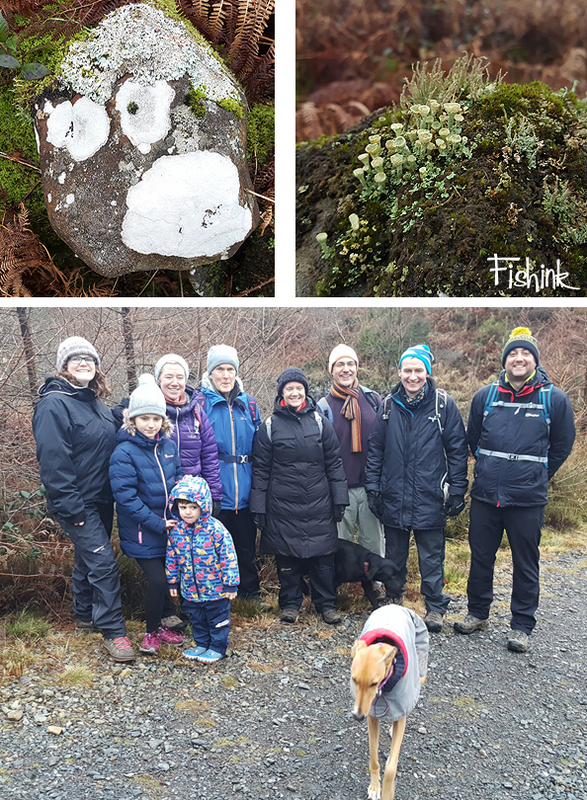 A second day we met up with more friends for a stroll around some beautiful countryside at Glentrool Visitor Centre near Newton Stewart. 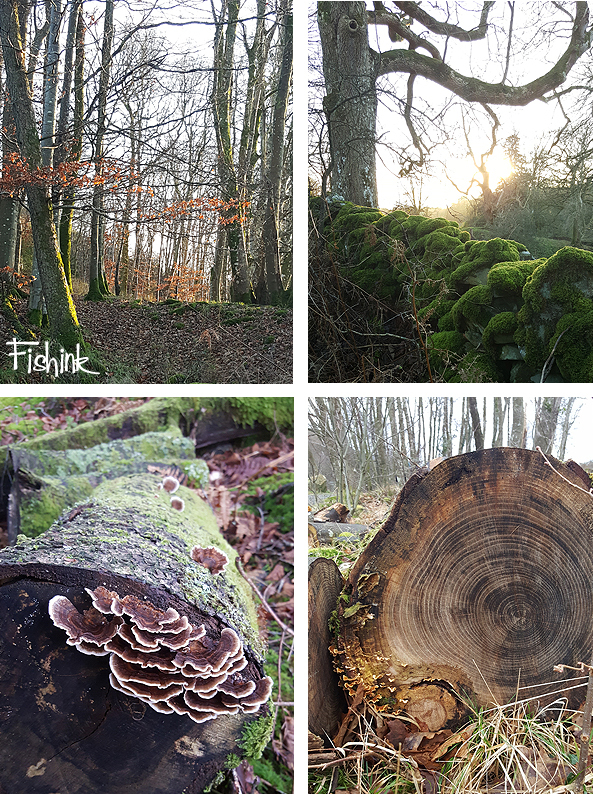 I loved photographing all these woodland wonders. Not sure little Ruaridh at the front is that happy about Boo being too near lol. 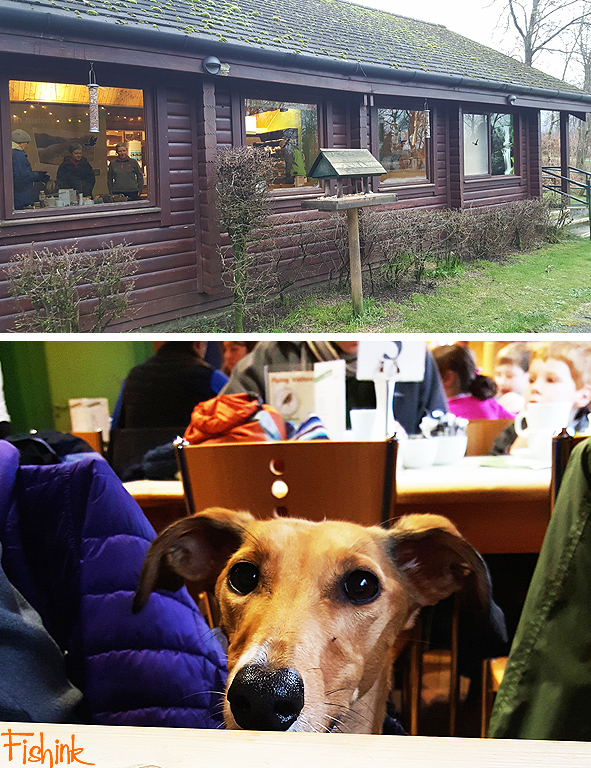 A cold but beautiful setting, and I’d really recommend the food made by the friendly staff in the visitor centre, well worth a visit… even Boo agreed! 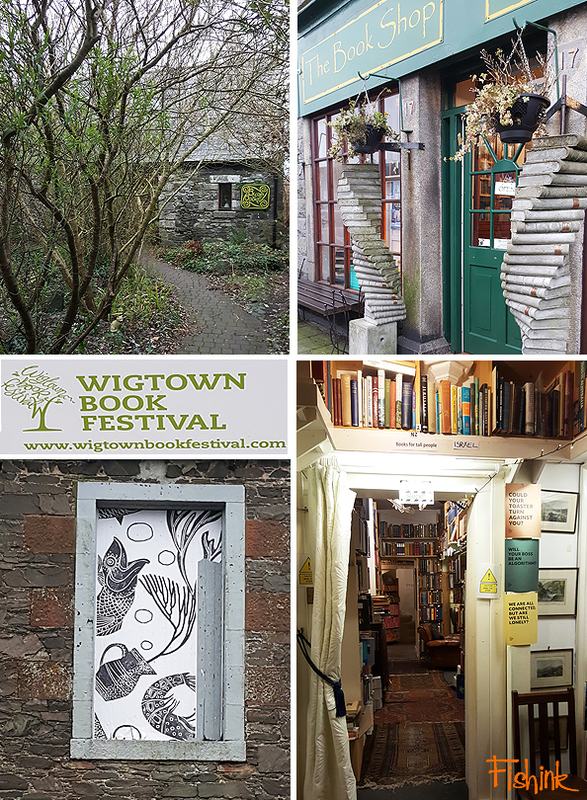 On the return journey we stopped off at Wigtown, which was officially designated as Scotland’s National Book Town in 1998 and is now home to a wide range of book-related businesses. Some bookshops weren’t yet open (it was just the 3rd January), but I had tempting glances of hidden away gems and at least 5 were open that I could wander around and be happy to loose myself in. 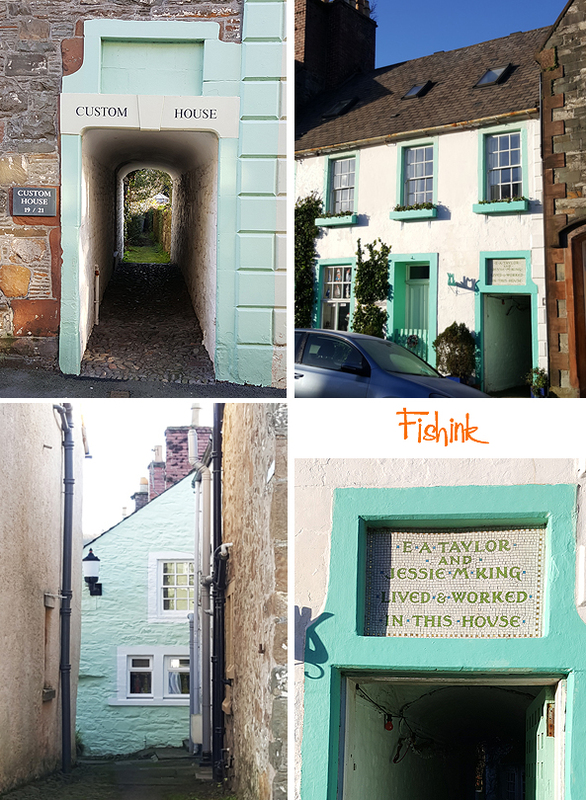 I loved the work of Astrid Jaekel as I bought a few of her postcards and then discovered how she had covered some of the shops in Wigtown for their Book Festival, click the link for some images. 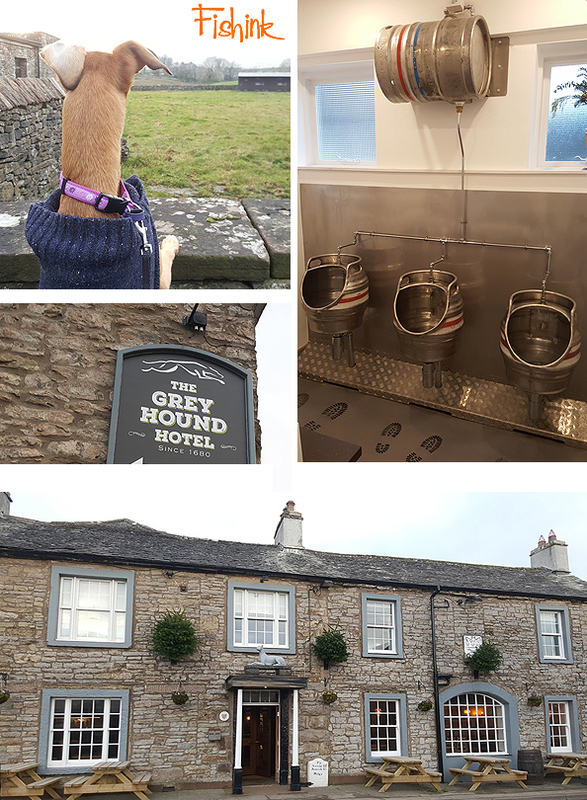 On the way back to Manchester we side stepped the services for a visit to Shap and discovered this quirky and beautiful Greyhound Hotel. Great welcome and tasty food will make it a firm favourite for future stop offs. 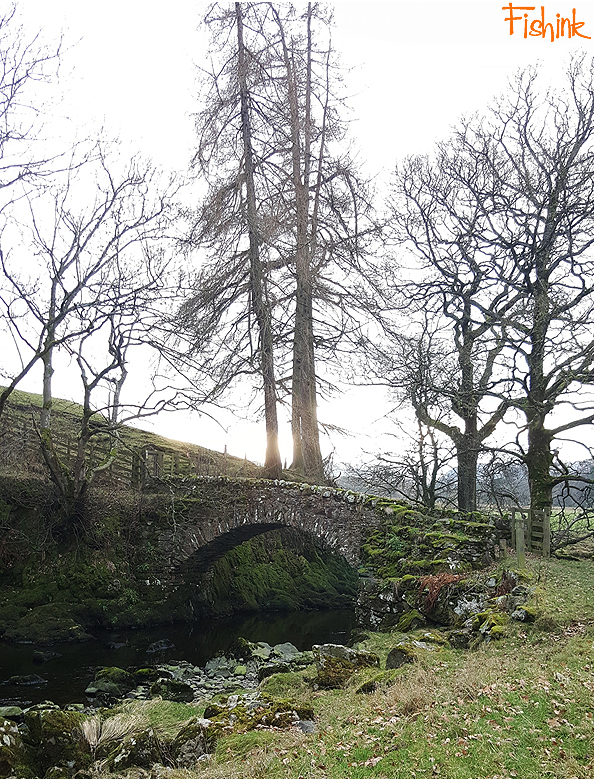 We also headed for a quick walk to find the remains of Shap Abbey and found this stunning bridge. Sorry no prizes in our ‘Spot the Boo’ competition. A bit of a stormy grey day but still with atmosphere. A great NY holiday break. Boo certainly enjoyed her long walks and lazy chilled out evenings, as did I. If this isn’t a contended dog photo then I don’t know what is. Hope you enjoyed coming along on my travels too. 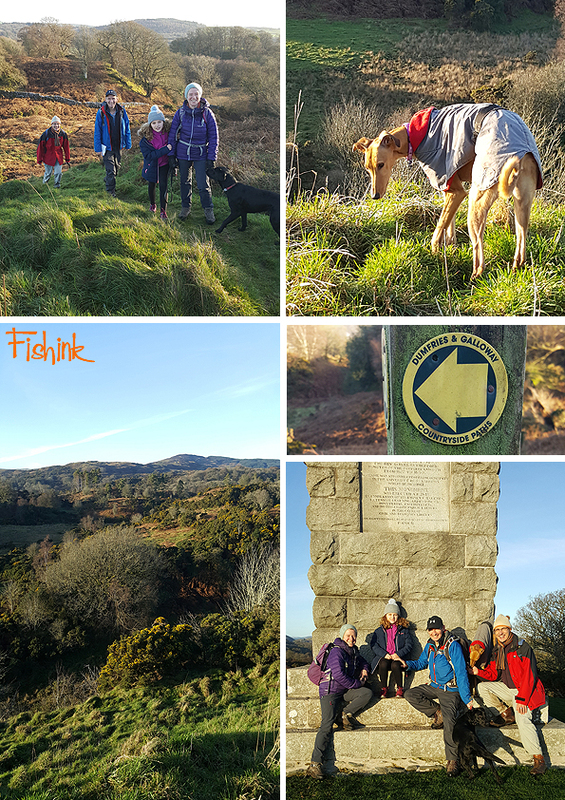 How did you spend your festive break ? 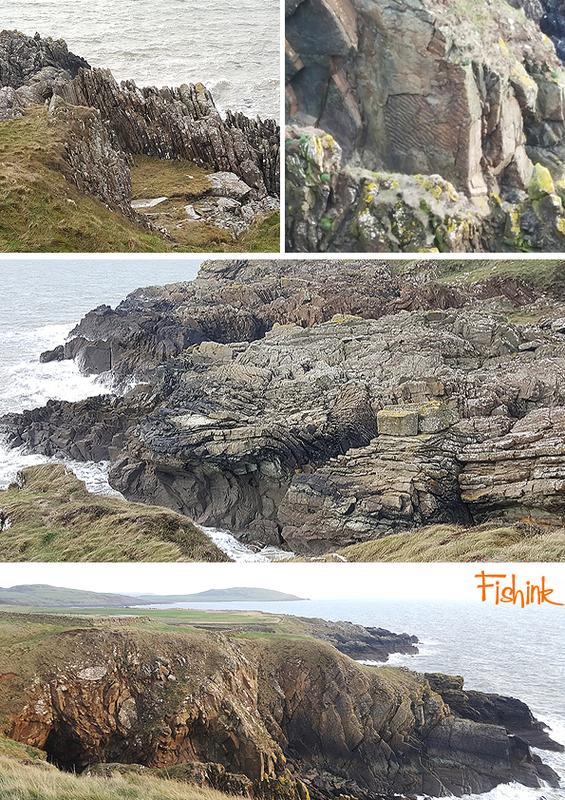 Hello to one and all and welcome back to Fishinkblog 2019. 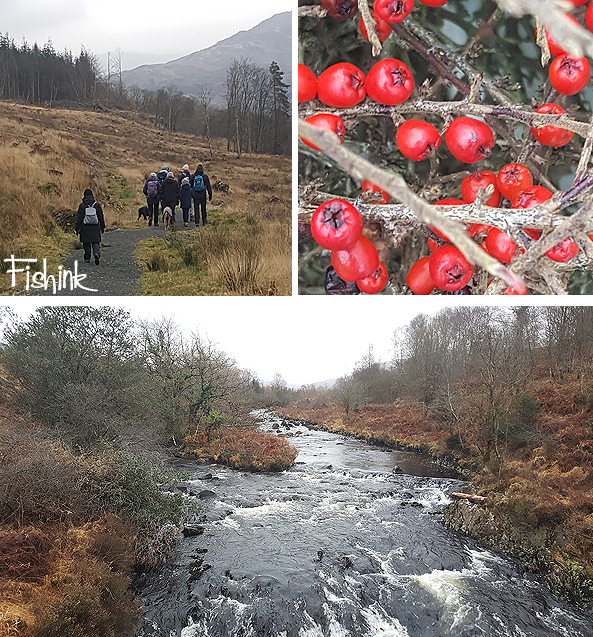 I hope you all had a great festive break and managed to switch off and recharge yourselves in preparation for a fresh beginning. Many thanks for all of your thoughts, comments and well wishing, much appreciated as ever. So what did you all get up to over the two week break ? 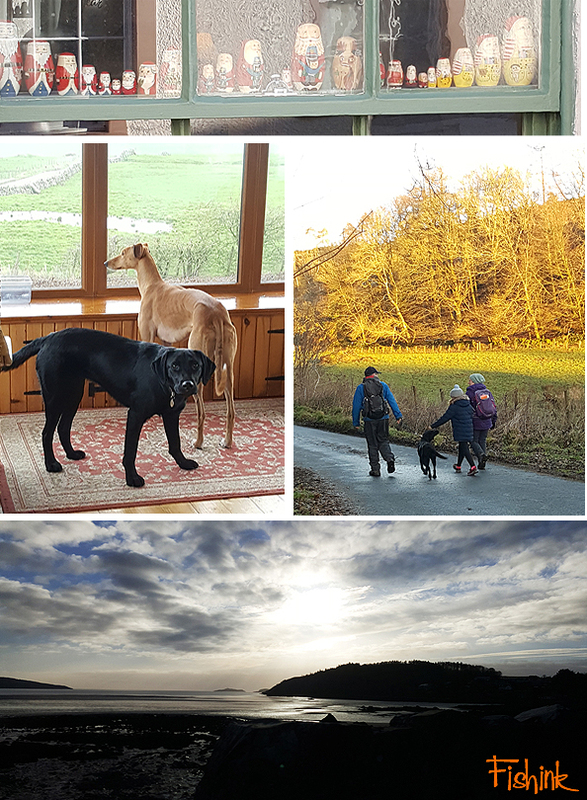 I had booked a cottage in southern Scotland and escaped there for New Year, with some friends who also have a dog. 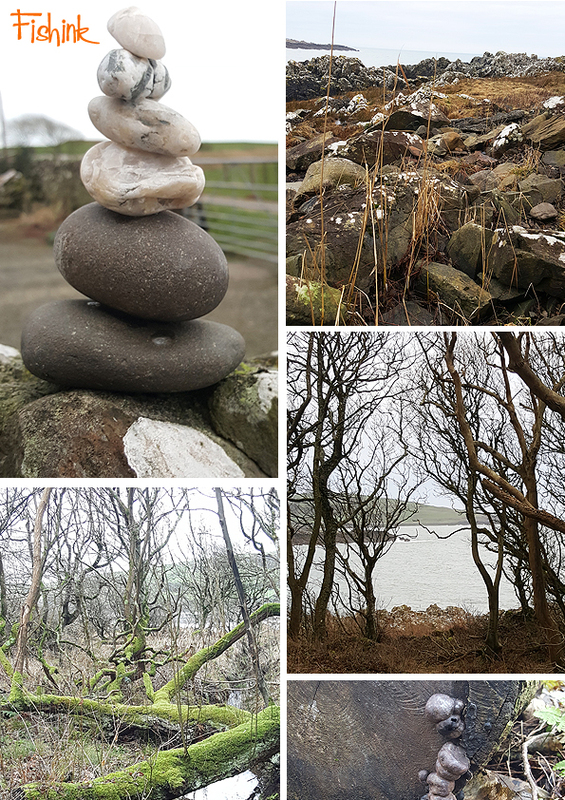 We spent lots of time walking, cooking and keeping away from the internet…. perfect ! 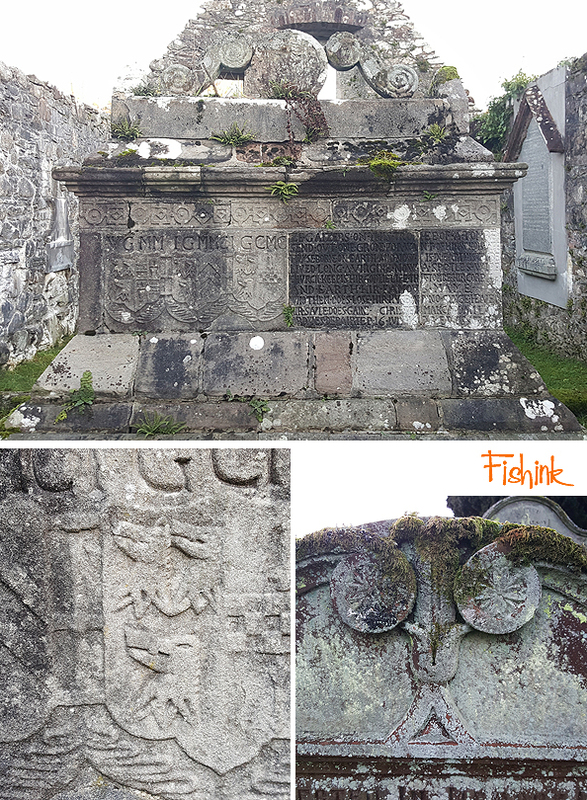 I thought I’d share my Scottish travels with you for the next two posts and I hope you enjoy the images as much as I did creating them lol. 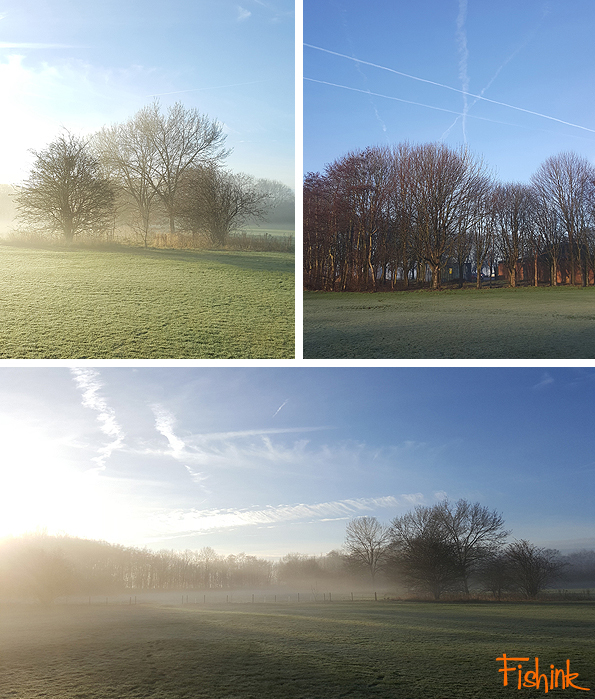 First here’s a few images from local walks around Manchester, starting with a beautiful misty light. 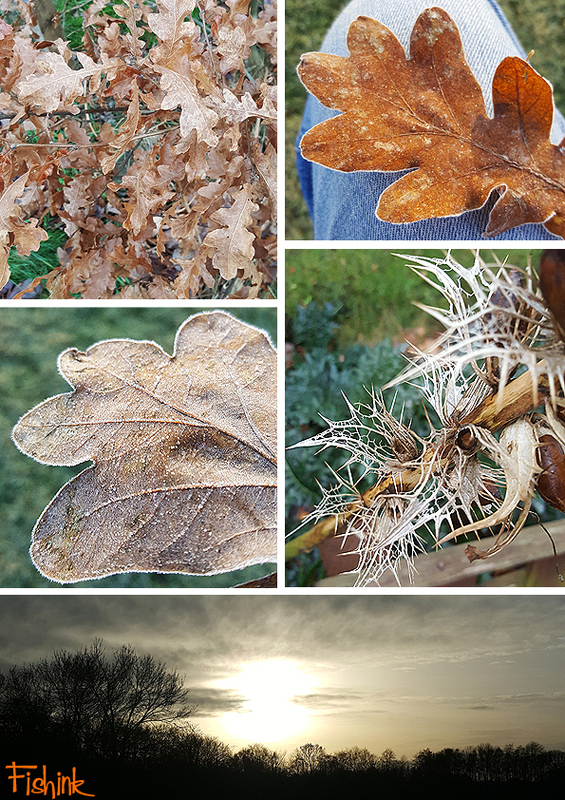 These were mid December, we were so lucky with the weather in 2018, that long hot summer… wow. Feels long ago now. A few frosty specimens, I love how the edges are all defined and white . 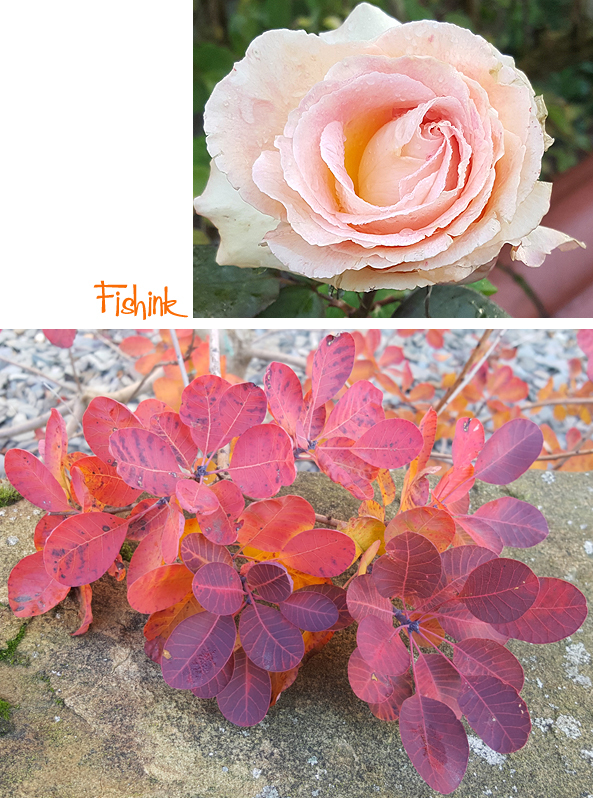 Even roses out in late December, surprised me. 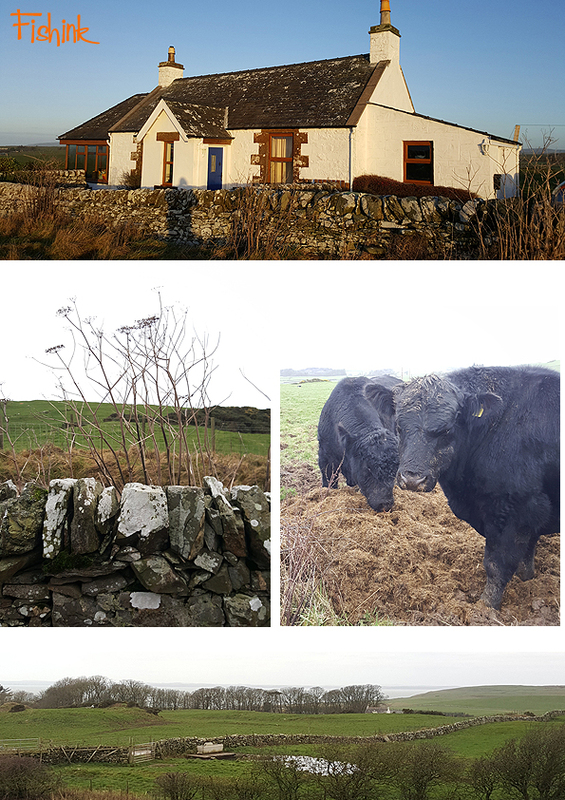 Ok so we’re off to Scotland and a little cottage near to Borgue, between Dumfries and Stranraer. 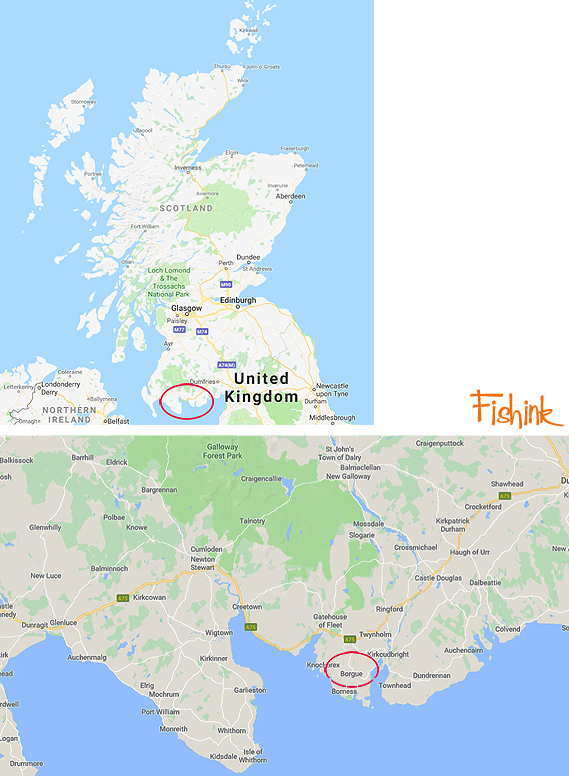 For those of you who like to see a map or don’t know where in the British Isles I’m talking about here’s one lol. 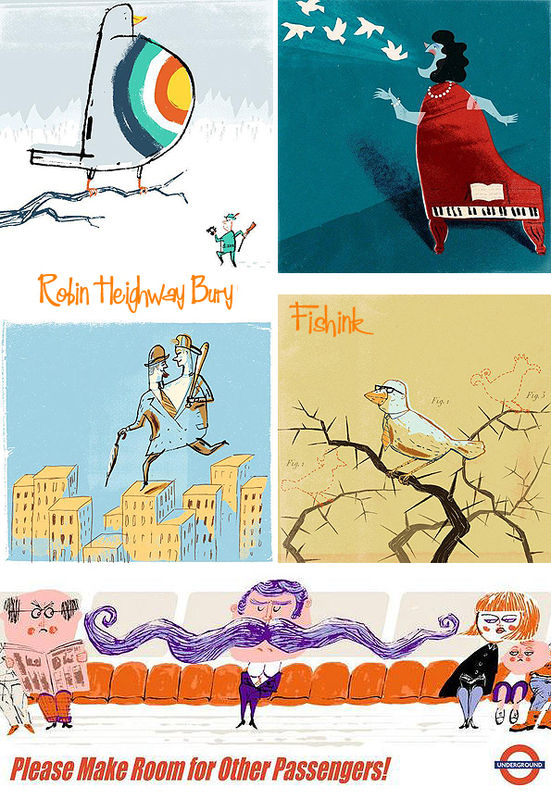 Here’s the place, some local views and a snapshot of our huge neighbours ! One thing we all enjoyed were the excellent views from the cottage and it’s proximity (10 min walk) to the local beach. Wild, rugged with plenty to discover and captivate. Petrified mushrooms (above right) and a wonderful impression of sand ripples (below right), fossilised into the rock over time and then shifted to a vertical position by ancient earth movements. A wonderful coastline, and plenty to keep us busy on the beach too. 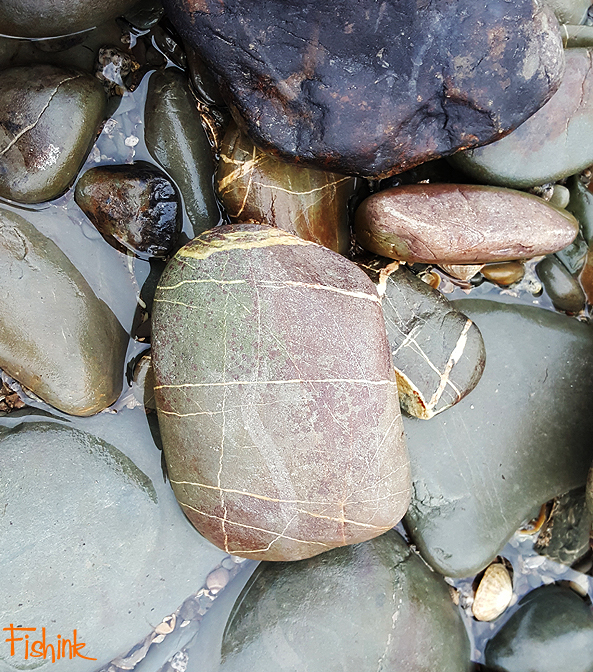 Anyone out there who also likes rockpool hunting? 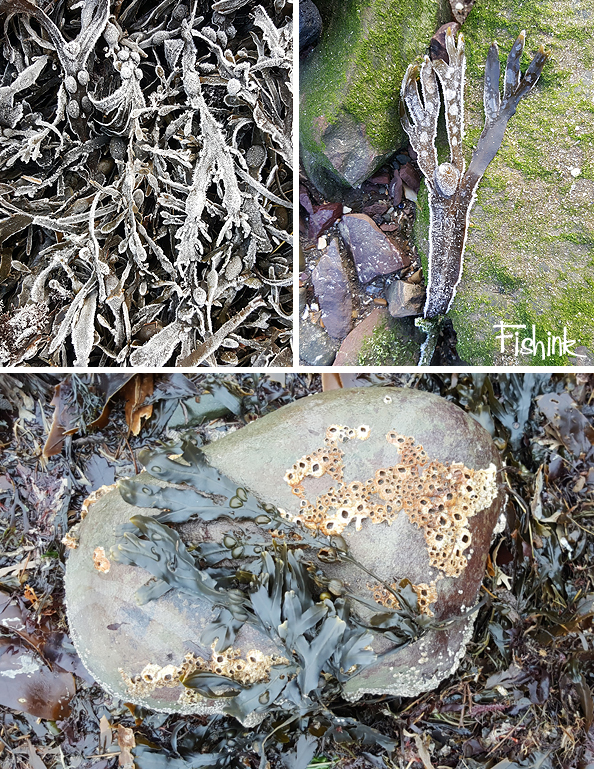 First time I’ve seen frozen sand and seaweed too. 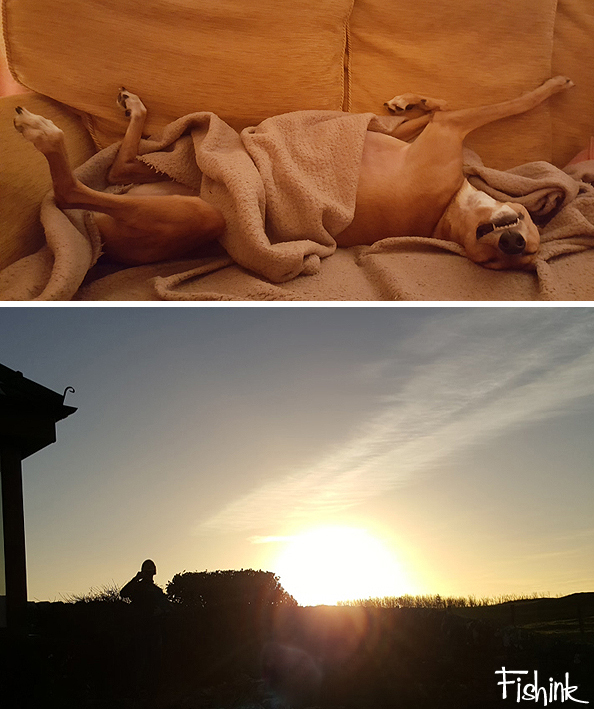 These were short days as the sun disappeared around 4pm, oh but glorious sunsets. 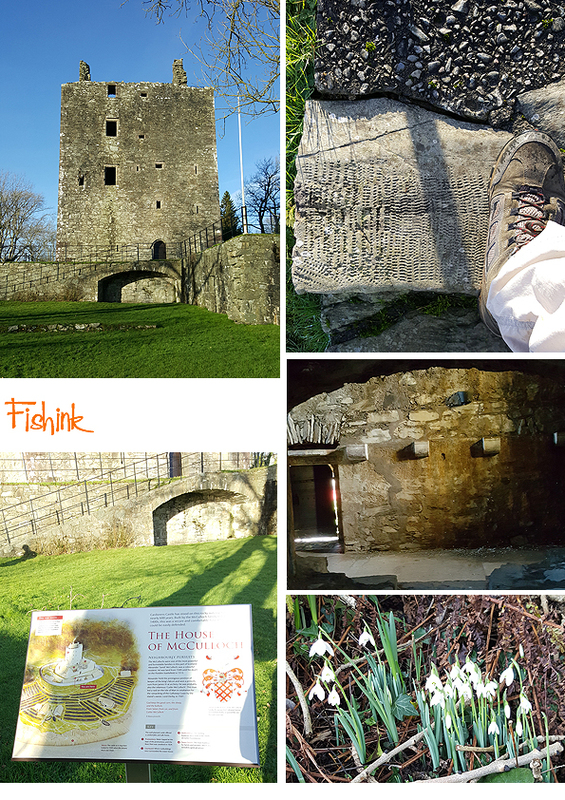 We came across this 15th century Cardoness Castle belonging to the McCullochs of Myreton. 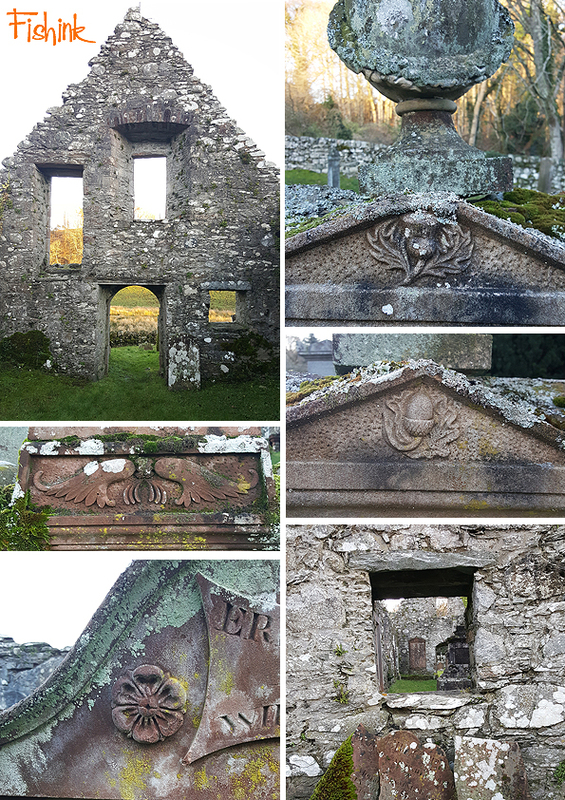 Then a walk around the local area to this graveyard in Anwoth. Some wonderful carvings. 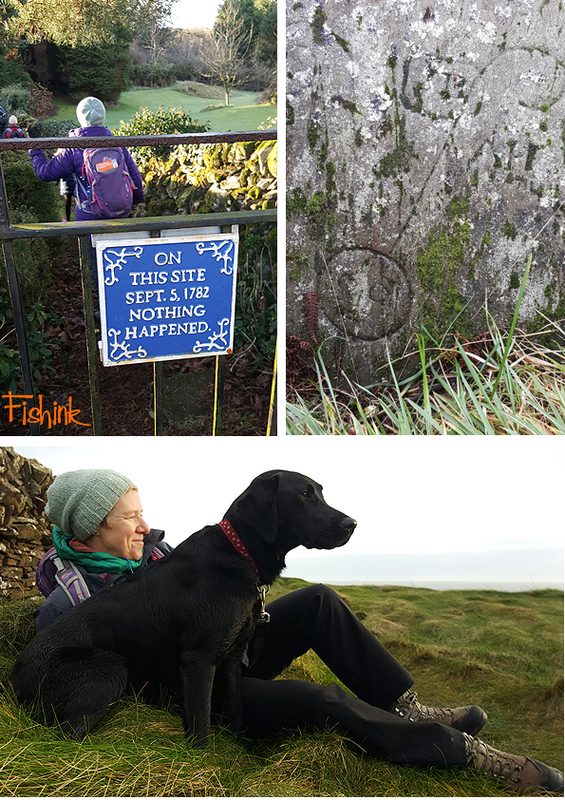 A joke sign and a local pictish carved rock up on Trusty’s Hill. 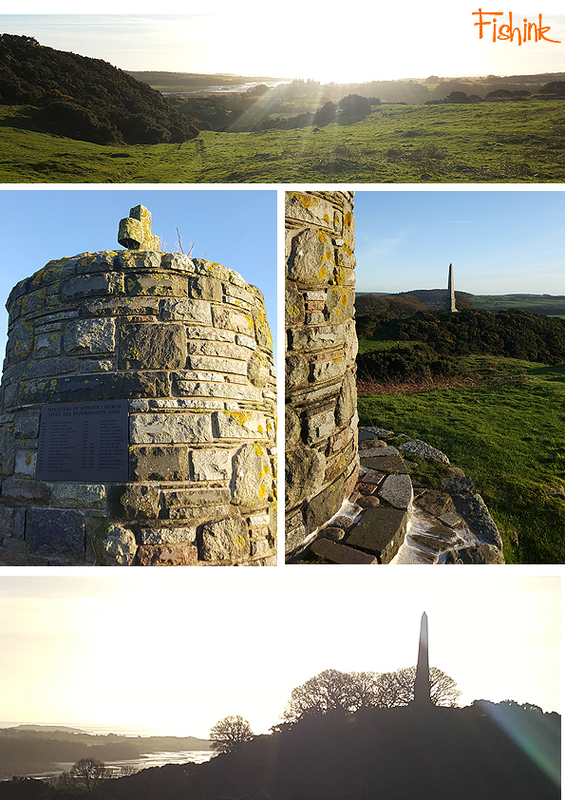 Great views and three monuments, including Rutherford’s Monument. We were lucky with the weather again. 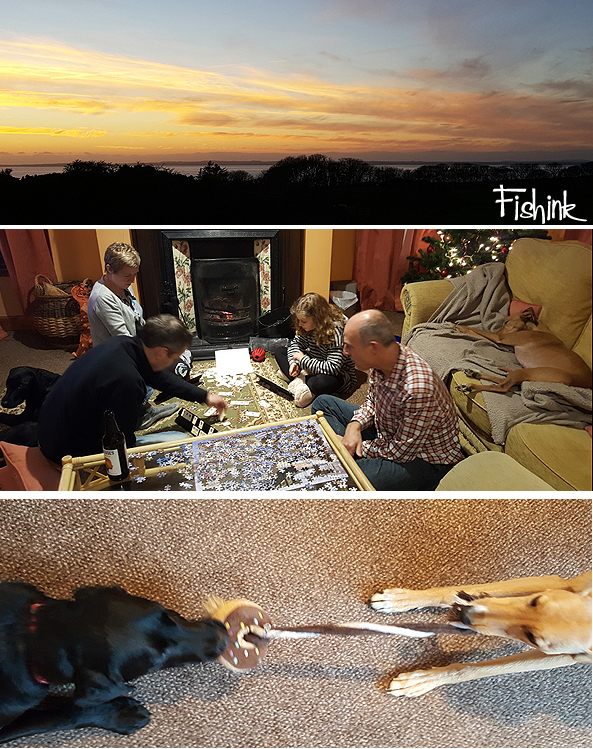 In the evenings we did some old fashioned things like reading books, doing jigsaws and playing board games. The dogs chased one another around the huge garden, played tug of war and did a lot of sleeping.. absolute bliss. 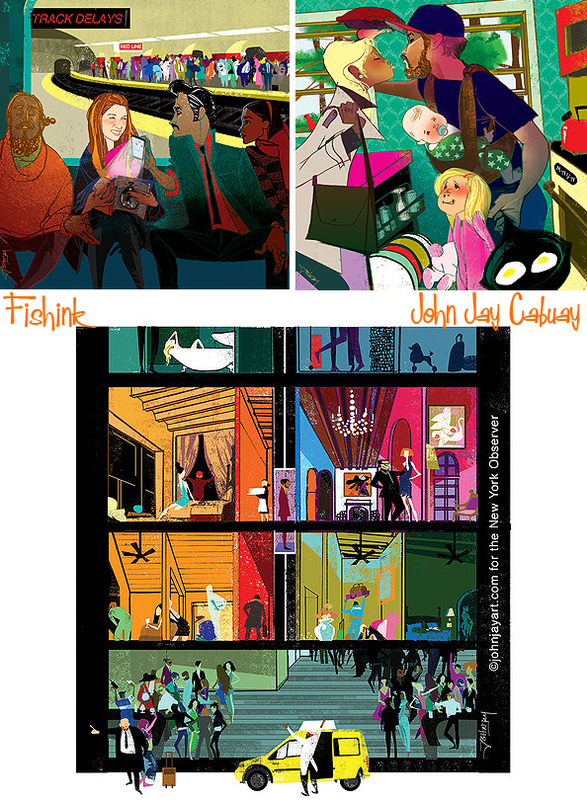 I decided to have a glance back over 2018 and pull together a range of images from the best / most enjoyable posts I’ve created over the twelve months. 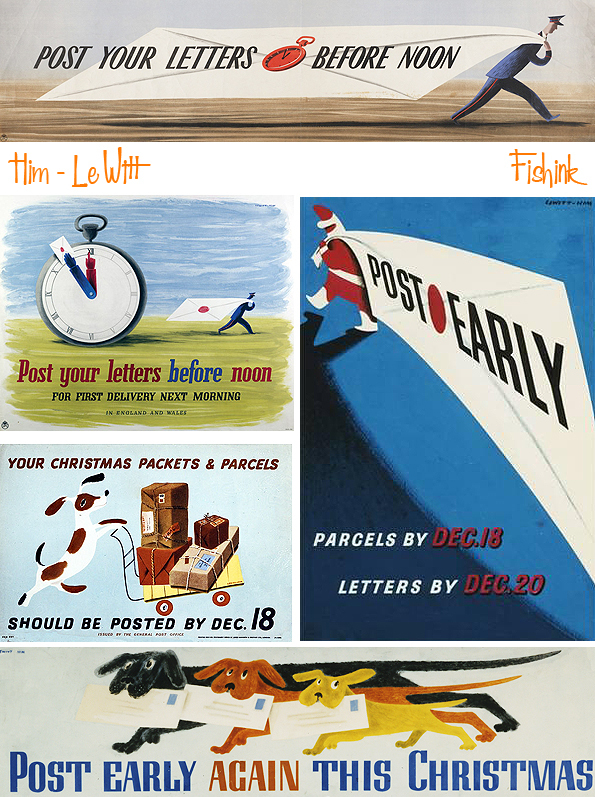 Which post is your favourite and how many do you remember ? 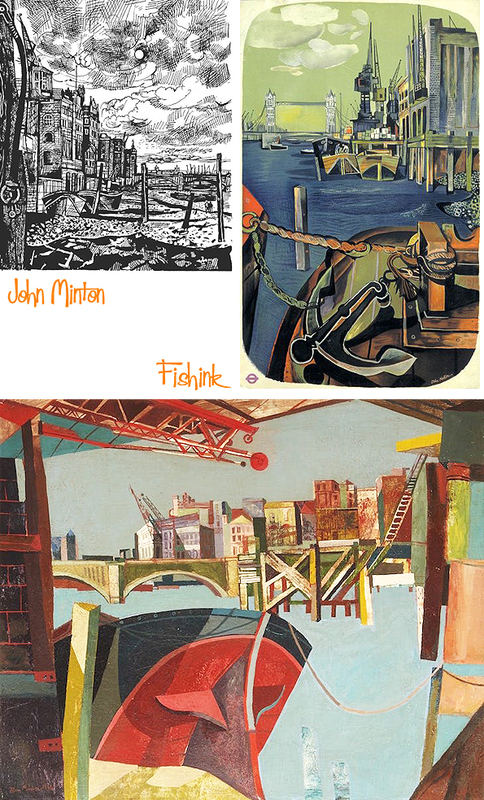 We start, back in January, with the four posts on John Minton, this being one of them. What a talented chap. 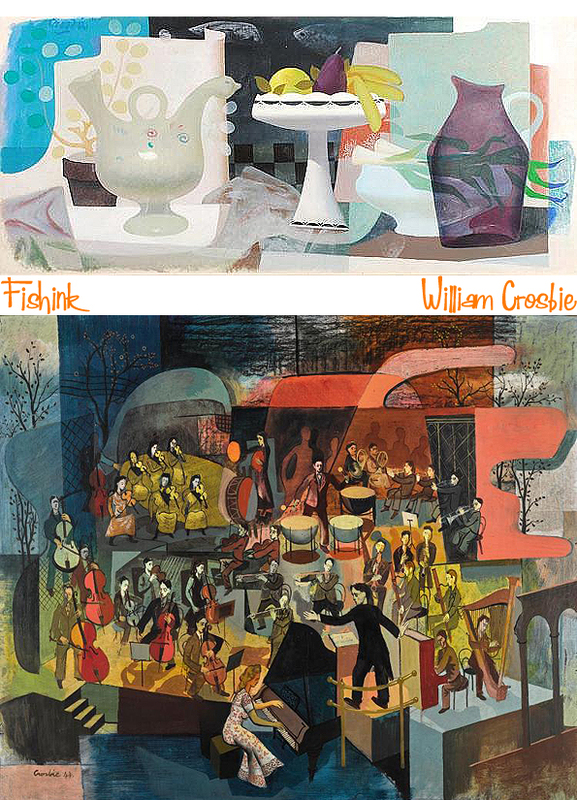 Great work by Scottish artist William Crosbie. 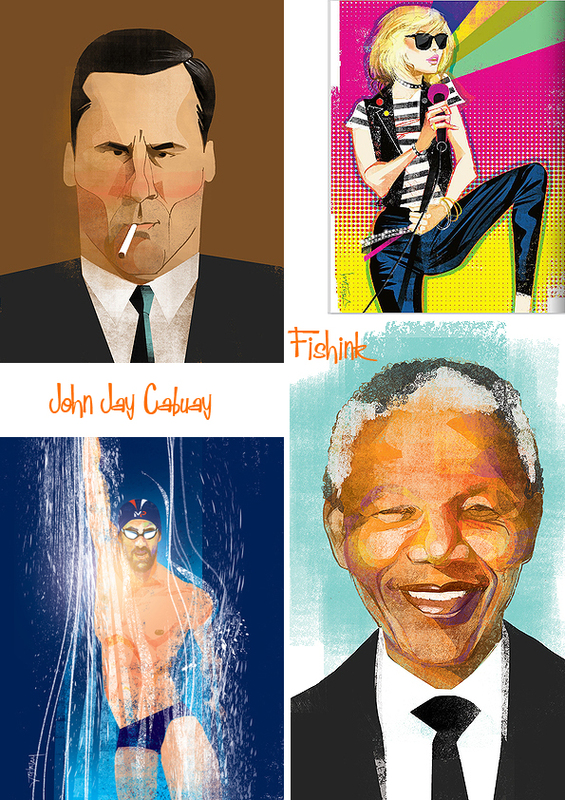 Slightly more contemporary work from Robin Heighway-Bury. 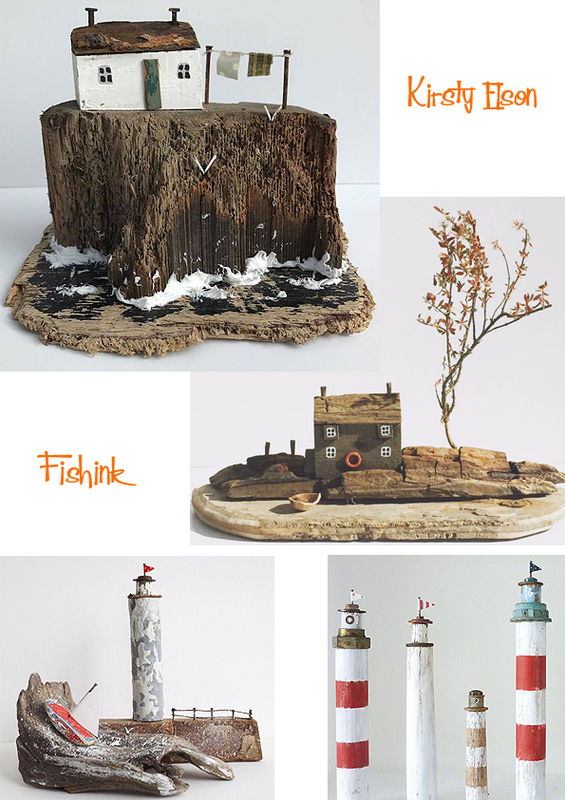 Beautifully crafted thoughts of the seashore from Kirsty Elson. 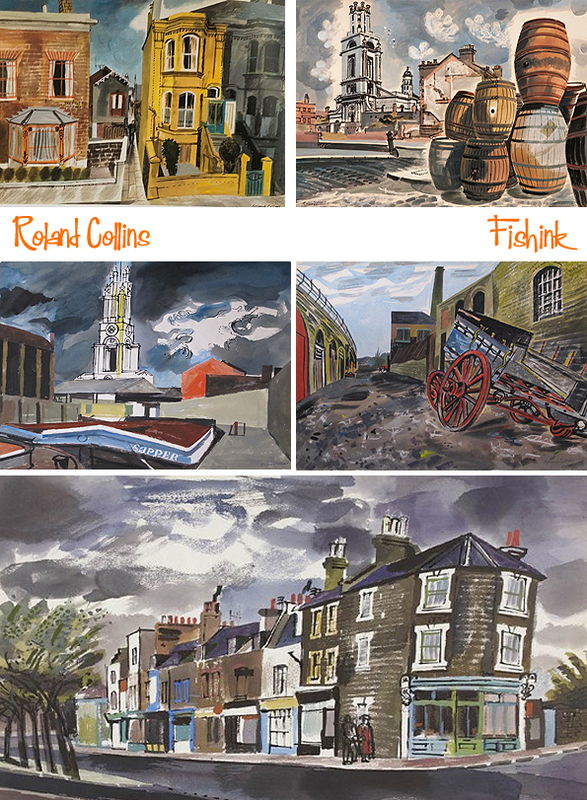 Forgotten artist in two parts, features the work of Roland Collins. 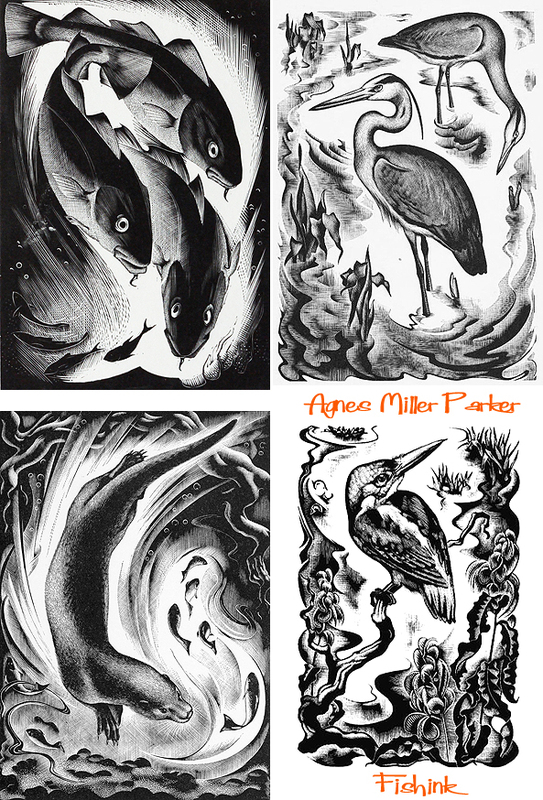 Wildlife woodcuts from Agnes Miller Parker. 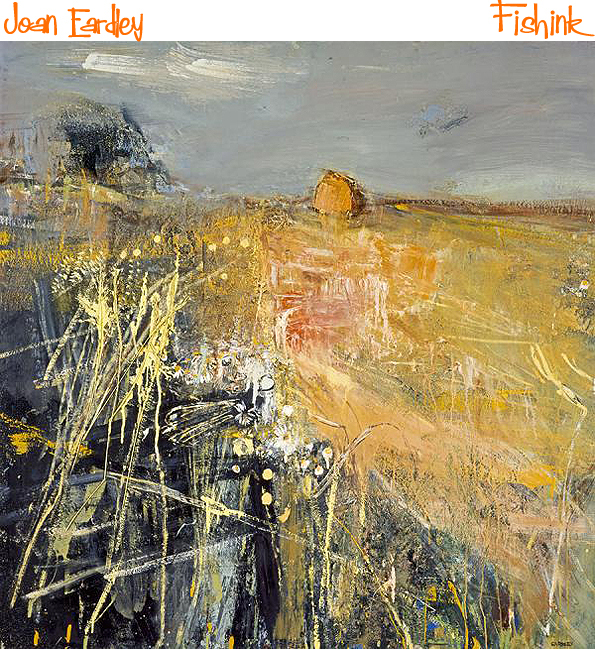 Another female perspective of land and sea from Joan Eardley. 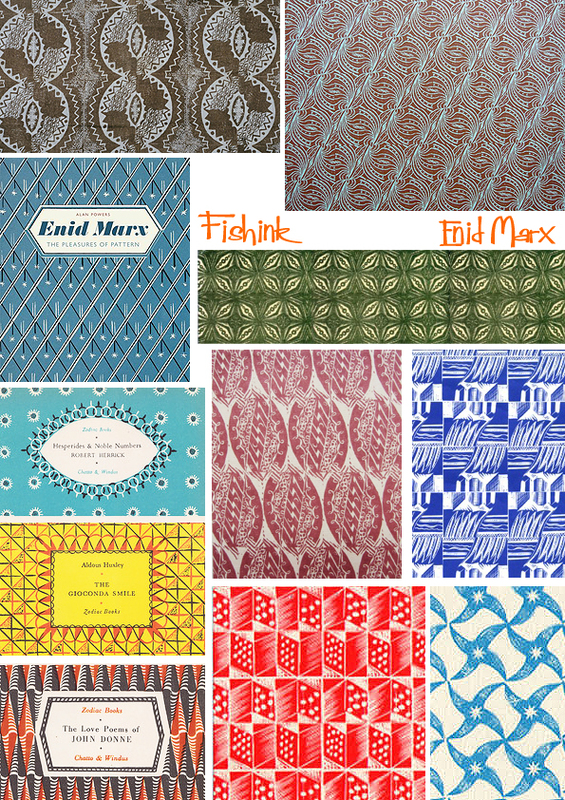 Textile and design repeats from Enid Marx. 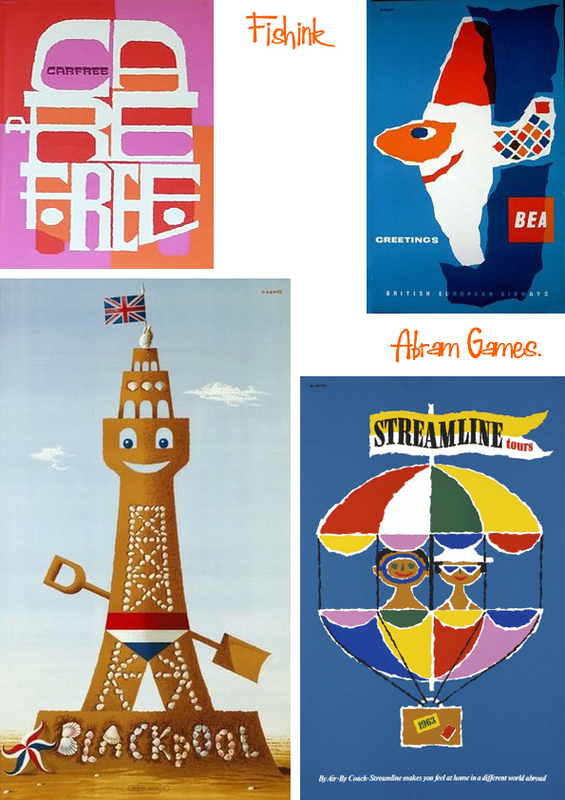 Fun travel posters from Graphic Designer Abram Games. 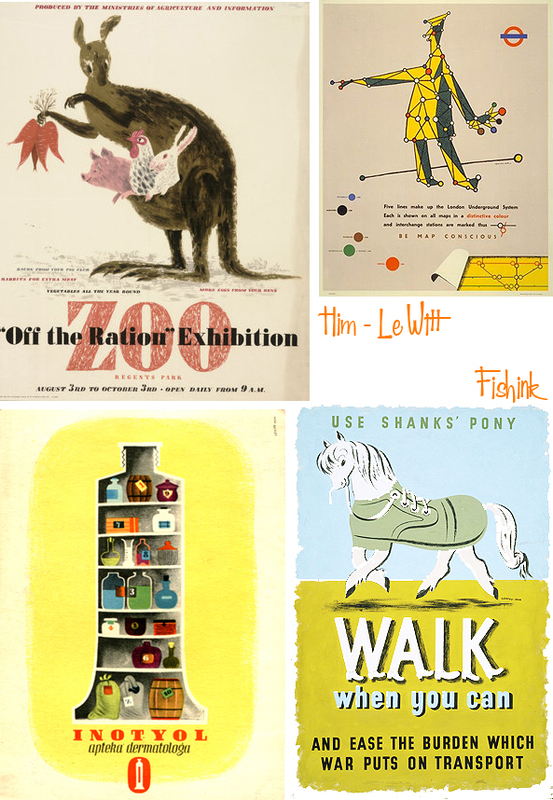 Two posts and more posters from Reginald Montague Lander. 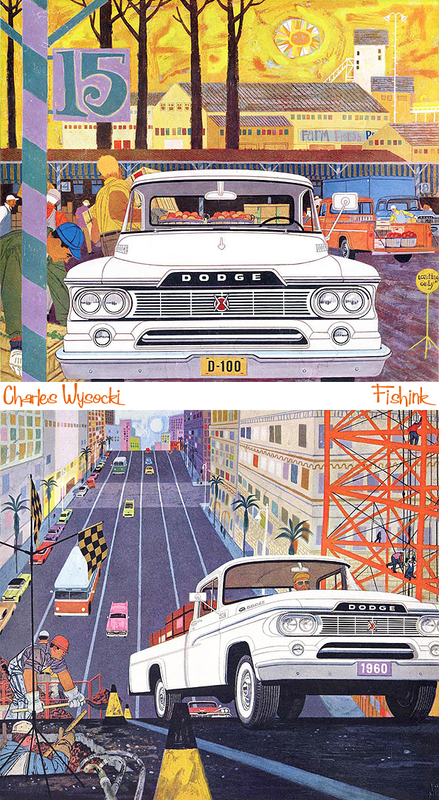 American sixties artist Charles Wysocki brought us Trucks and a glimpse of life in that era. 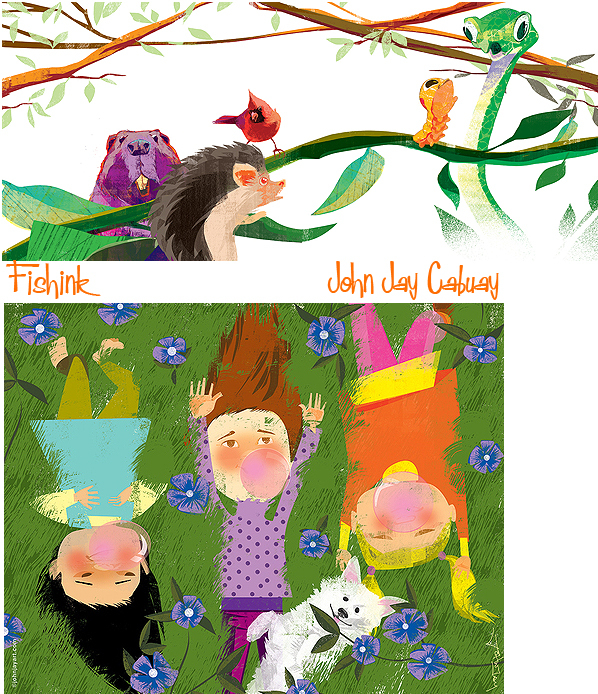 A little modern made nature from Mister Finch. 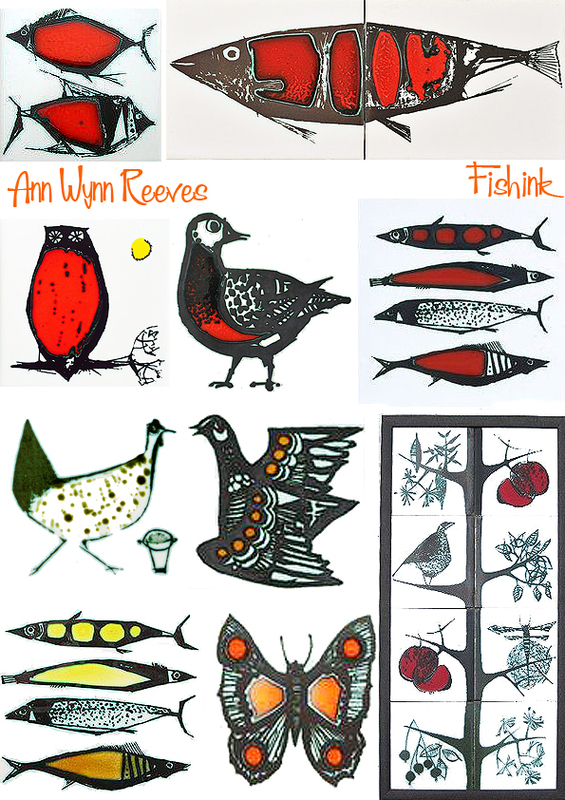 A glimpse of ceramic nature from Ann Wynn Reeves. 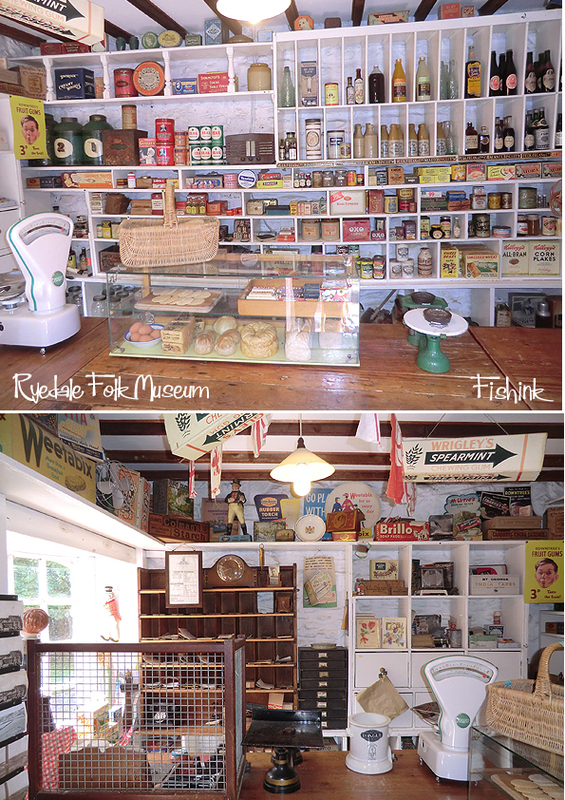 An inspirational trip back in time to Ryedale Folk Museum in Hutton Le Hole. 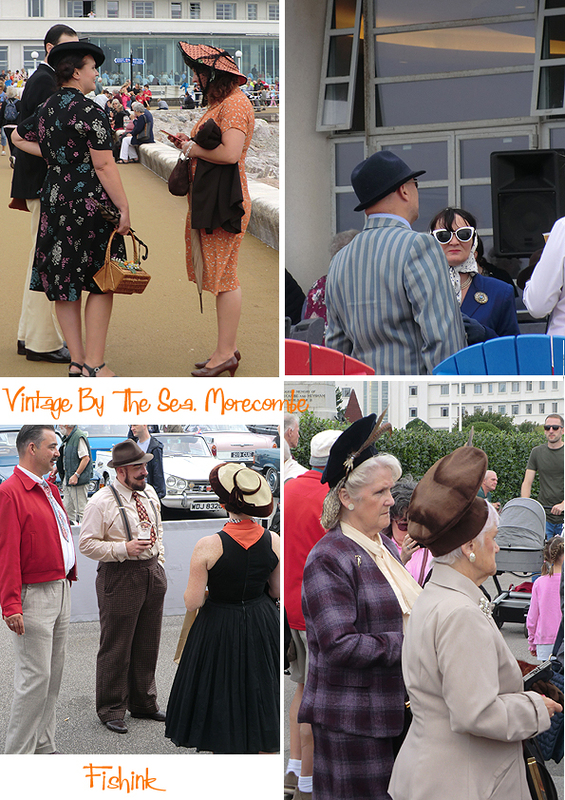 Also a splash of Vintage from Morecombe by the Sea. 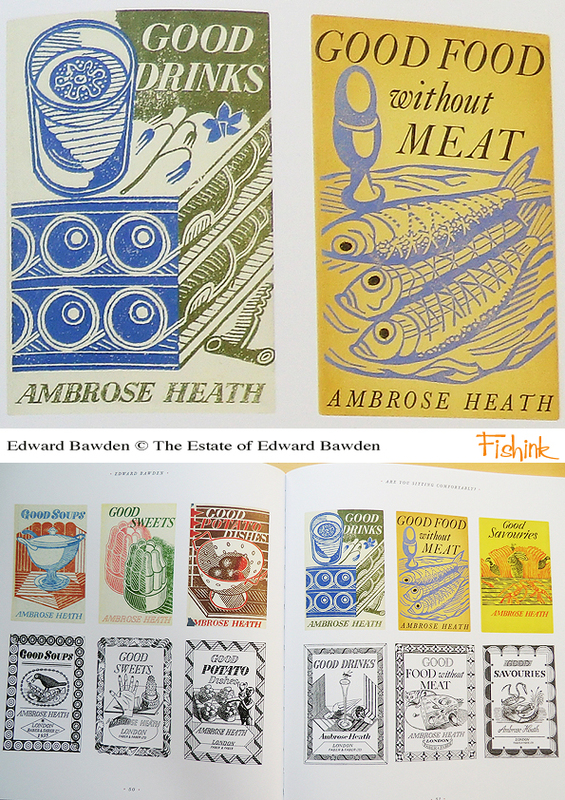 Edward Bawden and a fabulous book from the Mainstone Press. 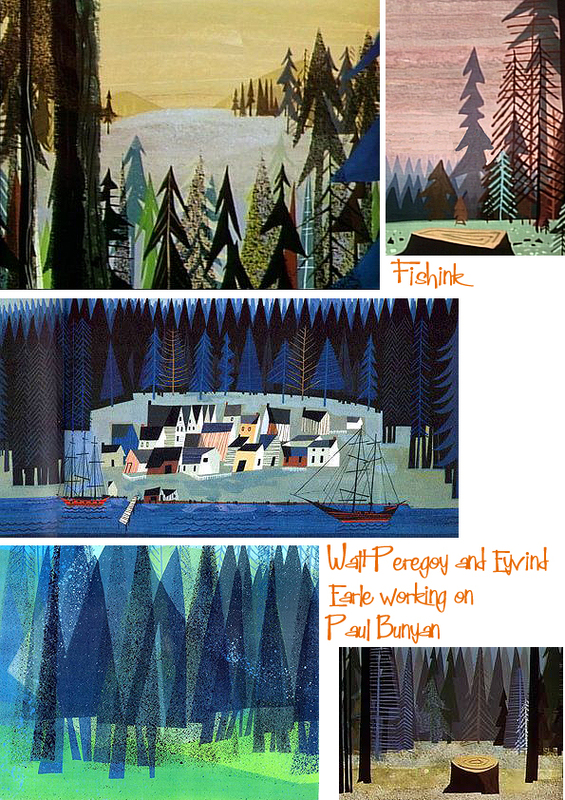 and lastly Disney background artist Walt Peregoy. 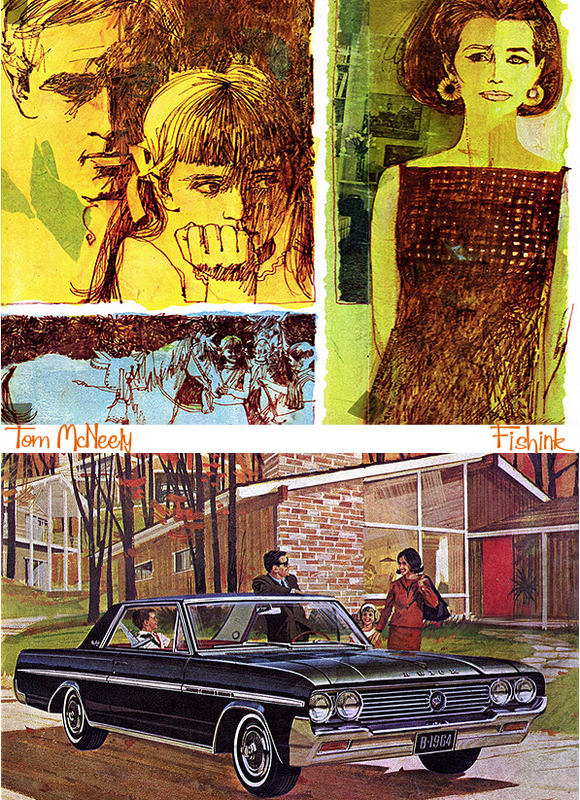 November Illustration from Tom McNeely. 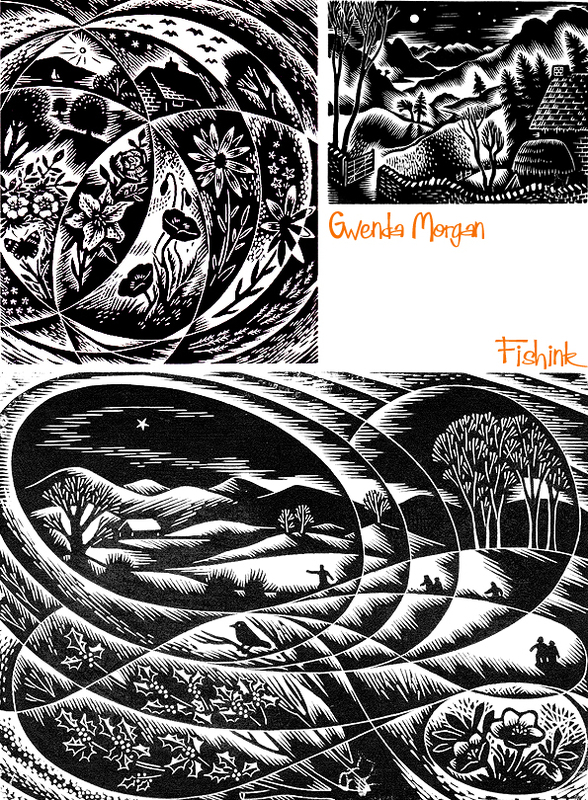 More recently some stunning woodcuts from Gwenda Morgan. 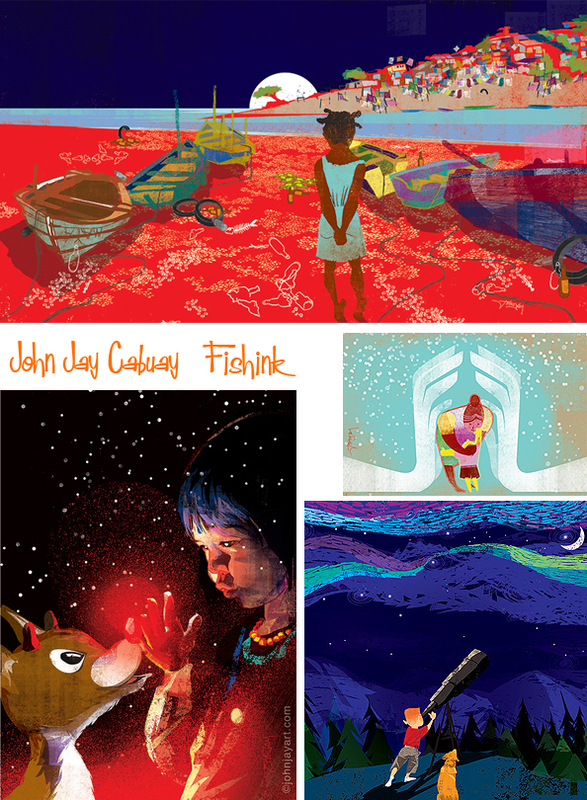 Contemporary work by John Jay Cabuay. 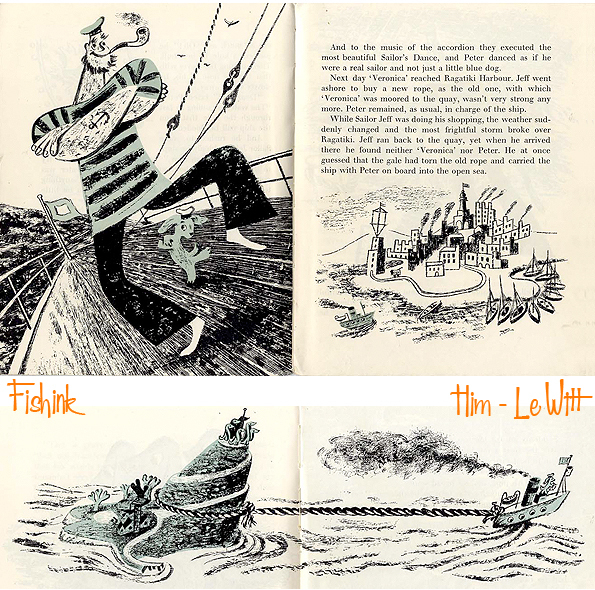 Timeless illustration from LeWitt and Him. 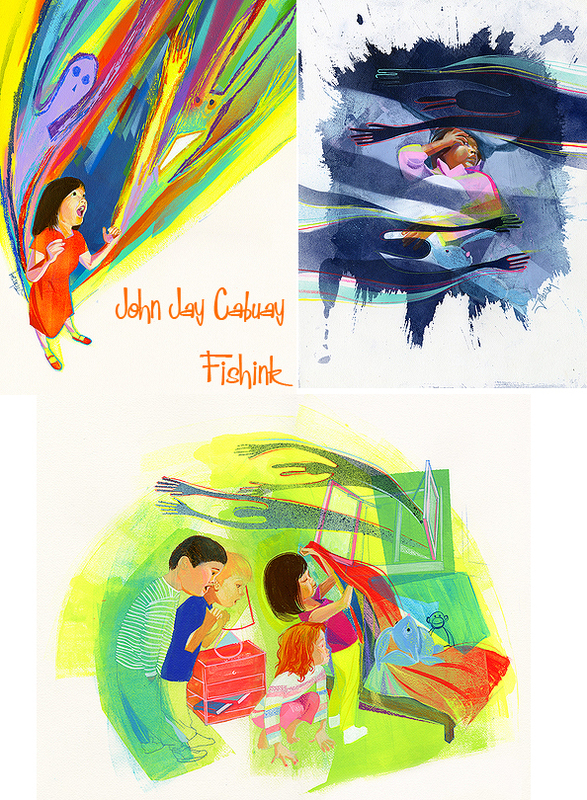 A few pieces of my own, which will be available to purchase next year through Fishink on Etsy. Which pieces do you like and why ? 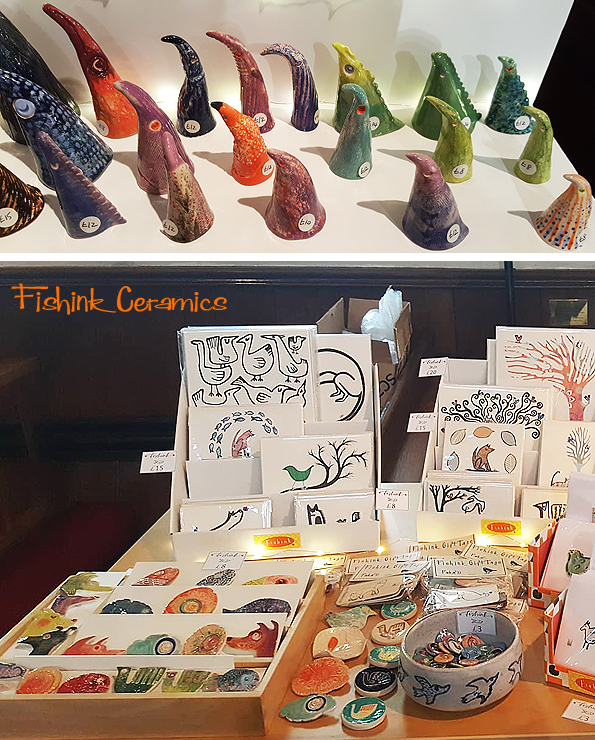 Anything you would like to see made in clay from my work ? 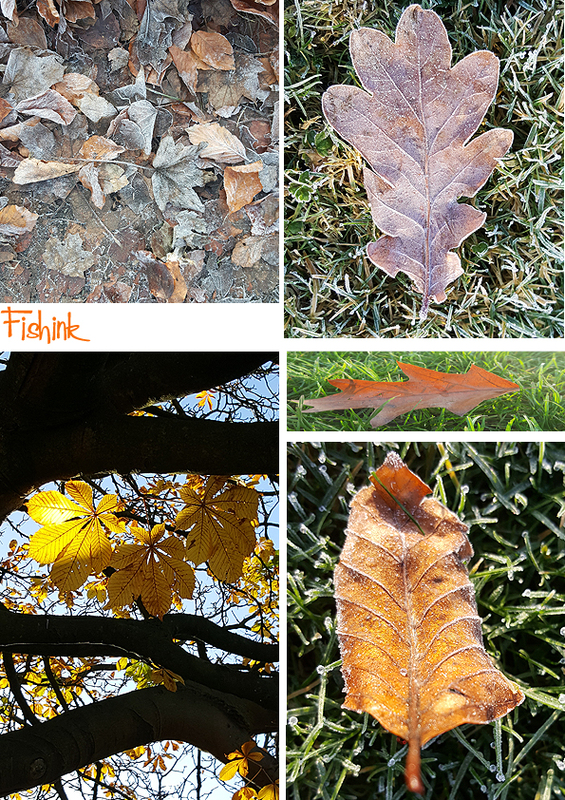 Thanks for following Fishinkblog this year. This is the Eighth year it’s been running and even though I really love writing and curating the posts, it doesn’t get any easier to find the time to do it all. 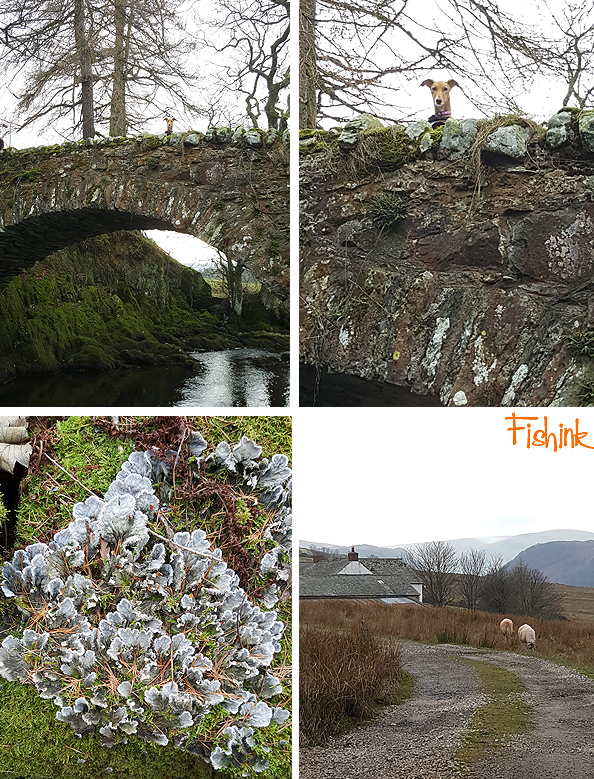 I do appreciate your feedback, likes and comments, it makes the whole experience much more fun to do, so thanks for leaving a word every now and then and if you have any thoughts on how Fishinkblog could be even better, then do let me know. 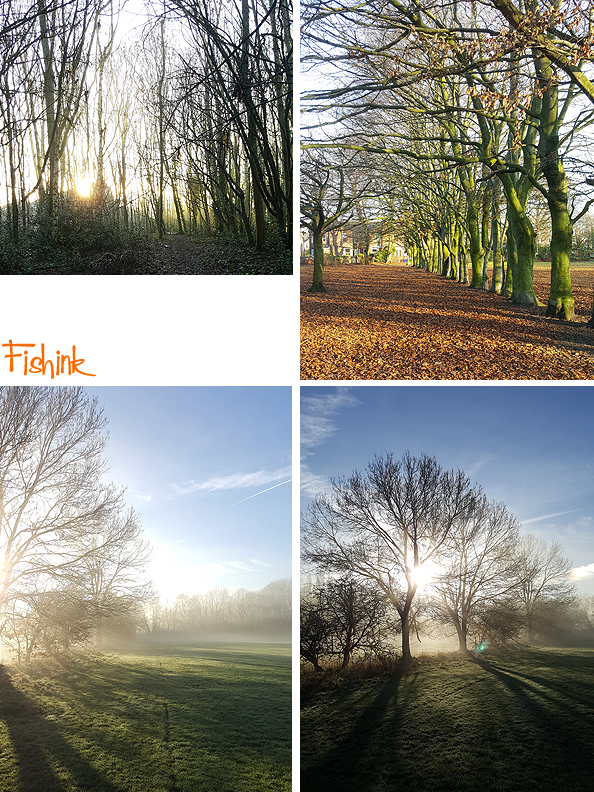 Have a look through the posts you might have missed by clicking on the links above the images, and pass Fishink blog onto a new friend this year so we can grow into a bigger art community from across the globe. It’s great to have you with me. Have a great 2019 and I’ll be back in a few weeks time. 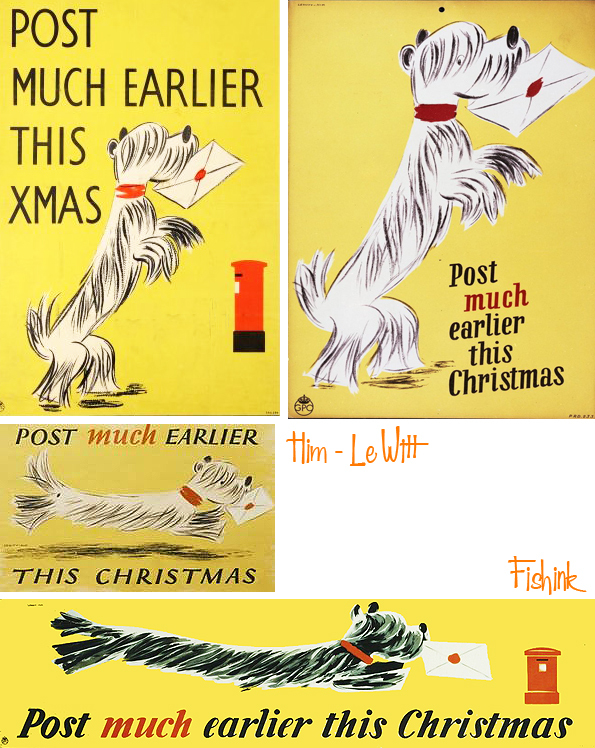 Happy Christmas Eve to one and all from the UK. Strangely I’m still not feeling so Christmassy this year but I’m sure come tomorrow I will be enjoying some great food, company and feeling good about the year ahead. 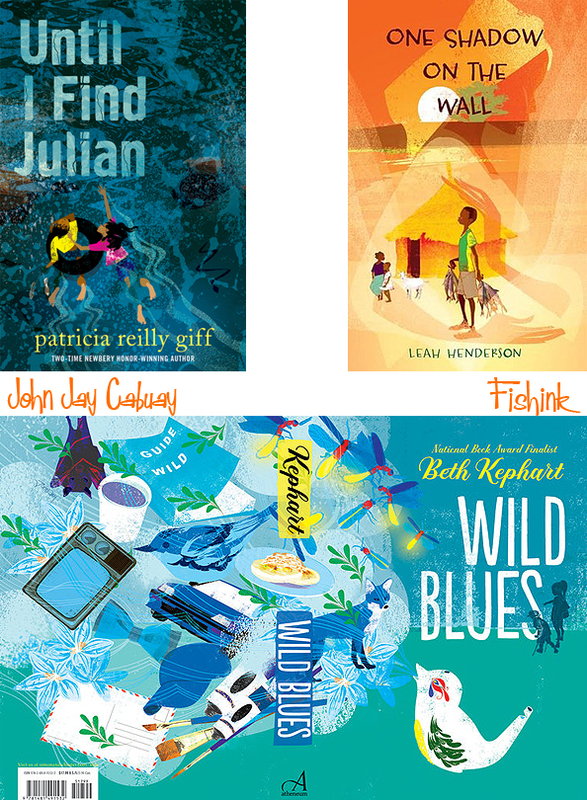 I wonder what kind of celebrations you, my readers will be having wherever you are reading this? Do let me know, and wherever you might be I hope this finds you well, healthy and in a peaceful time. 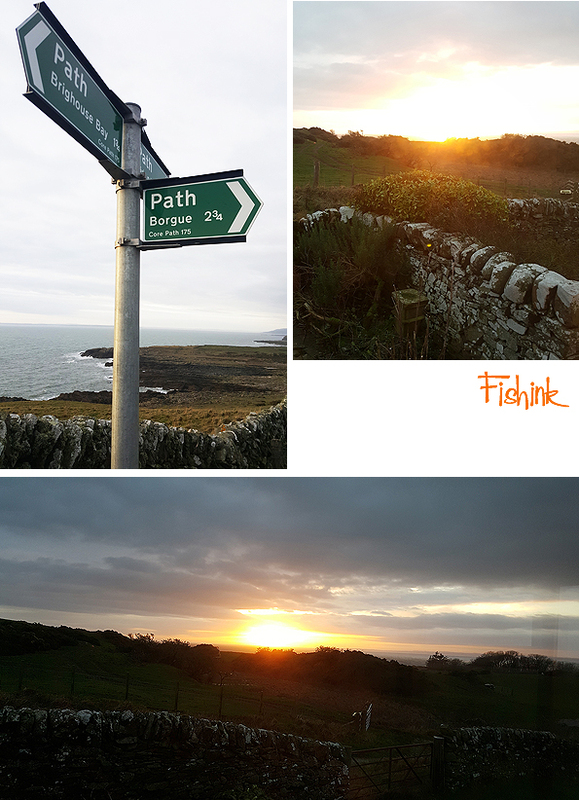 Thank you for following Fishink Blog this year and please keep the comments rolling in, it does make a difference and helps make me feel that all the hard work that goes into these posts isn’t falling on silent ears lol. 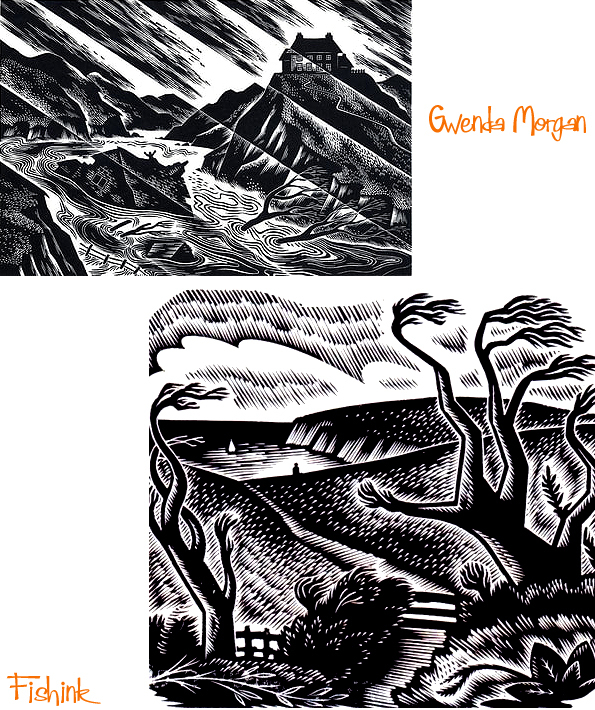 Gwenda Morgan (1908 – 1991) was born in Petworth, her father having moved there to work at the ironmongers Austens, of which he later became the proprietor. Following school in Petworth and at Brighton and Hove High School. 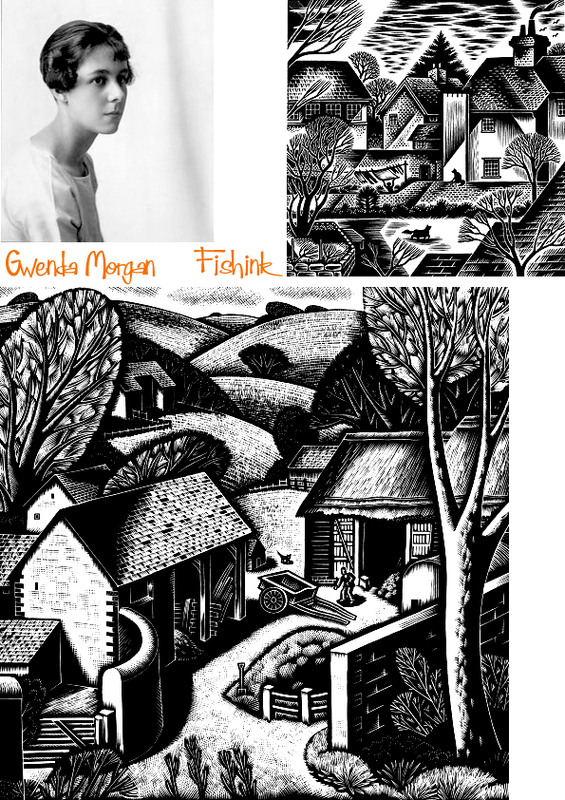 From 1926, Gwenda studied at Goldsmiths’ College of Art in London. From 1930 she attended the Grosvenor School of Modern Art in Pimlico where she was taught and very strongly influenced by the principal, Iain Macnab. 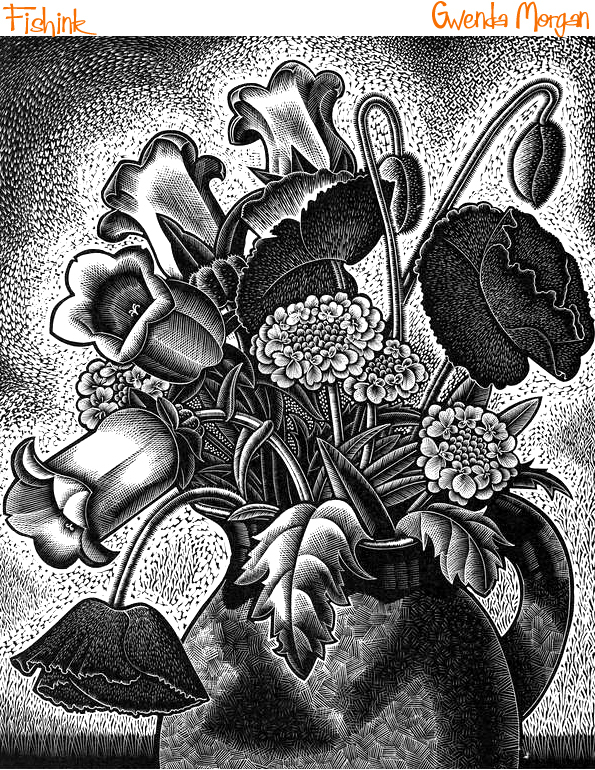 The Grosvenor School was a progressive art school, and the championing of wood engraving and linocuts fitted with its democratic approach to the arts. 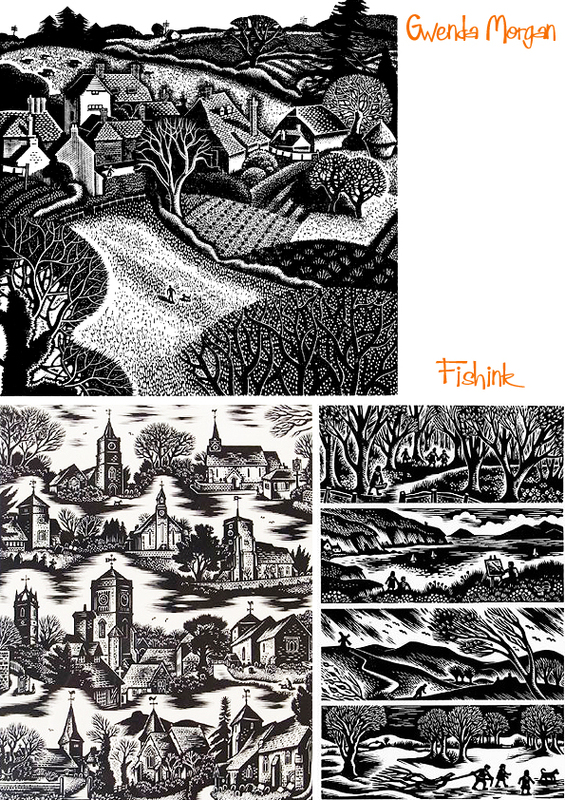 The main body of her work drew upon the landscape and buildings around Petworth and the neighbouring South Downs. 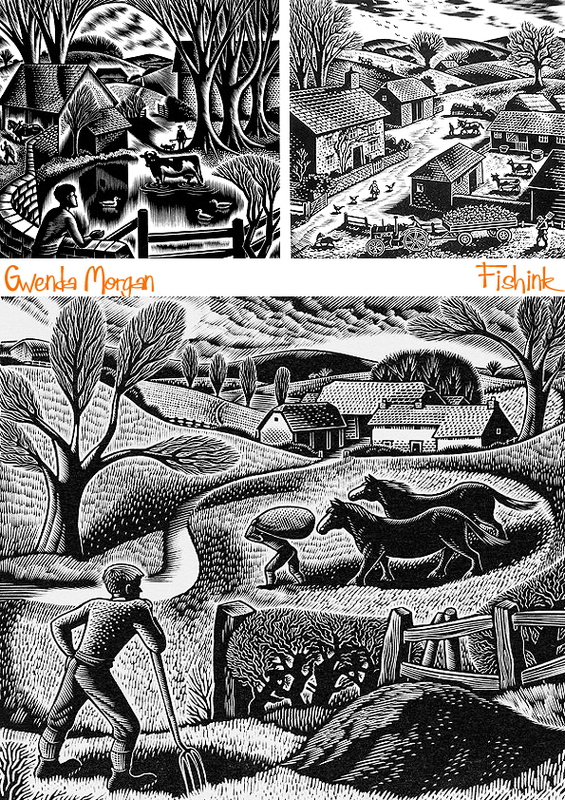 Her work was inspired by that of Iain Macnab, Percy Douglas Bliss and the Sussex-bred Eric Ravilious. 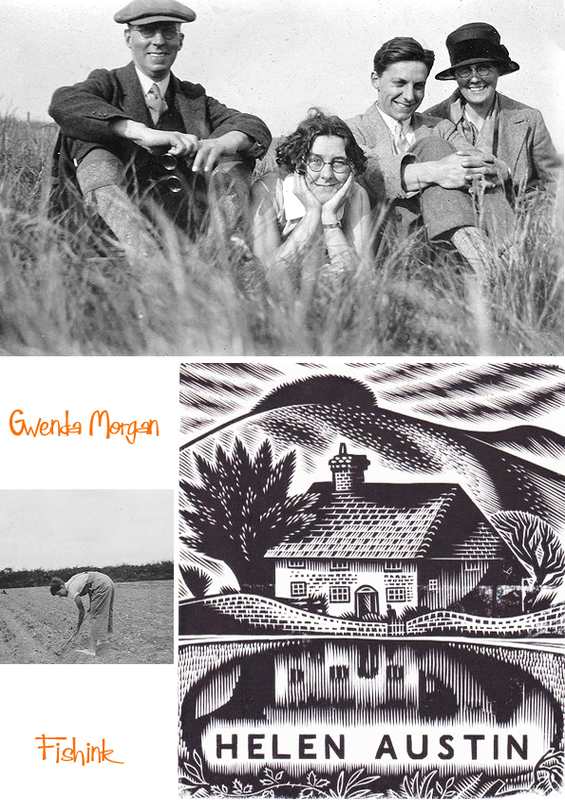 Throughout the Second World War she worked in the Women’s Land Army just outside Petworth. 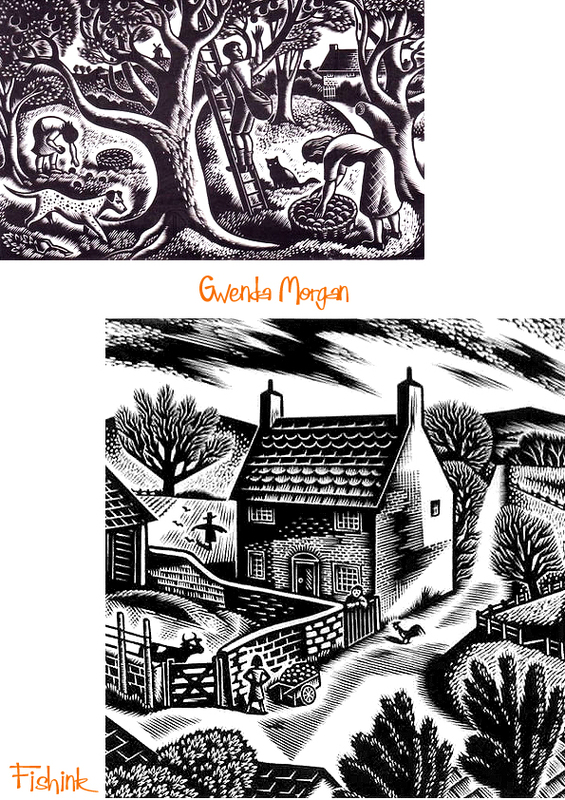 Her record of those years was published by the Whittington Press in 2002 as The Diary of a Land Girl, 1939-1945. It is a poignant record of the determination to carry on whatever the weather or wartime deprivations. 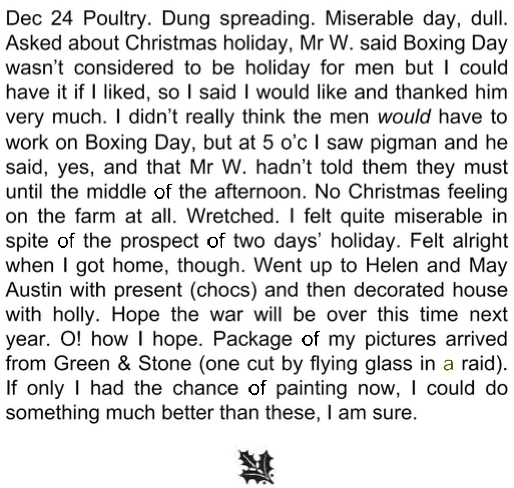 Here’s an excerpt from Christmas Eve. 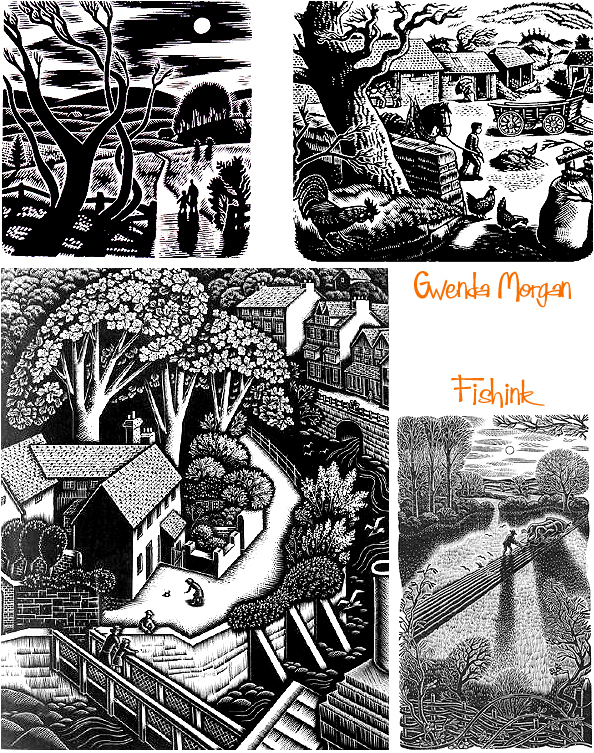 She was a Fellow of the Royal Society of Painter-Etchers & Engravers, an Honorary Member of the Society of Wood Engravers, and a Member of the National Society of Painters, Sculptors and Engravers, and she showed work at their annual exhibitions. 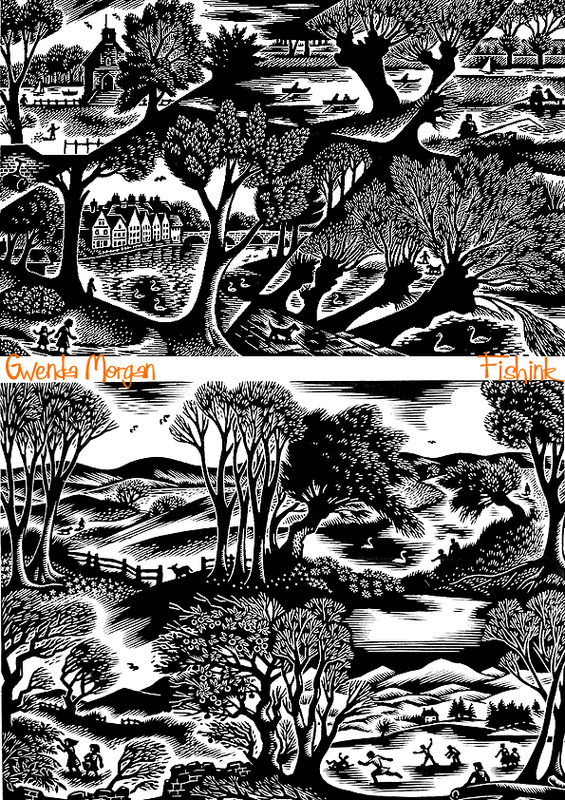 She also exhibited at the Royal Academy and at the Redfern Gallery. Her prints are held in the collections of the Victoria and Albert Museum and the British Museum in London, the Ashmolean Museum in Oxford, and the Fitzwilliam Museum in Cambridge, among others. 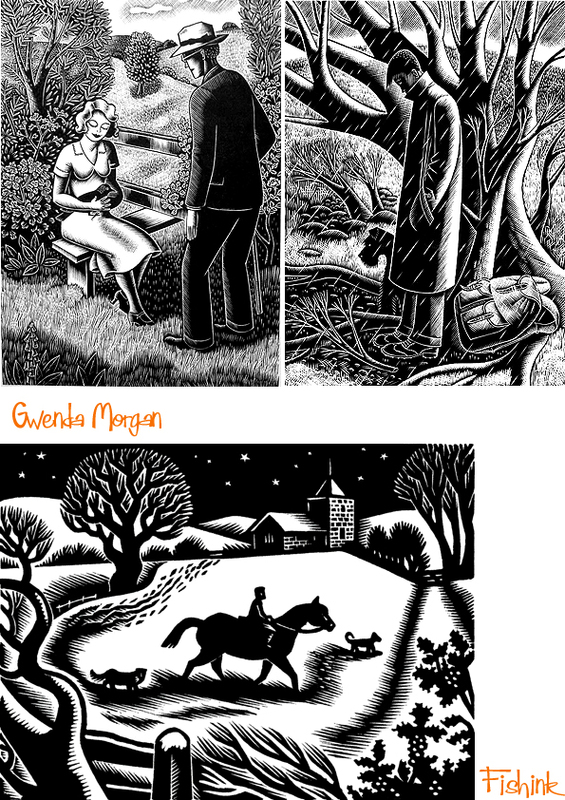 Some of her work has a wonderful sense of movement… even the still life woodcuts! 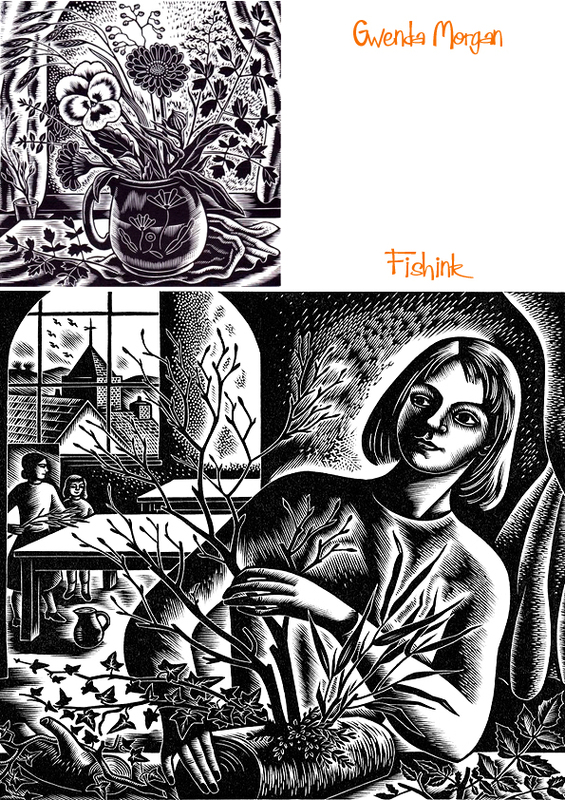 I feel that Gwenda’s work is somehow timeless, like this image above called ‘Winter Arrangement’, it feels like it could have been created last week and not over 60 years ago, as it was originally engraved in 1954! Here’s a great shot of Gwenda with her family. 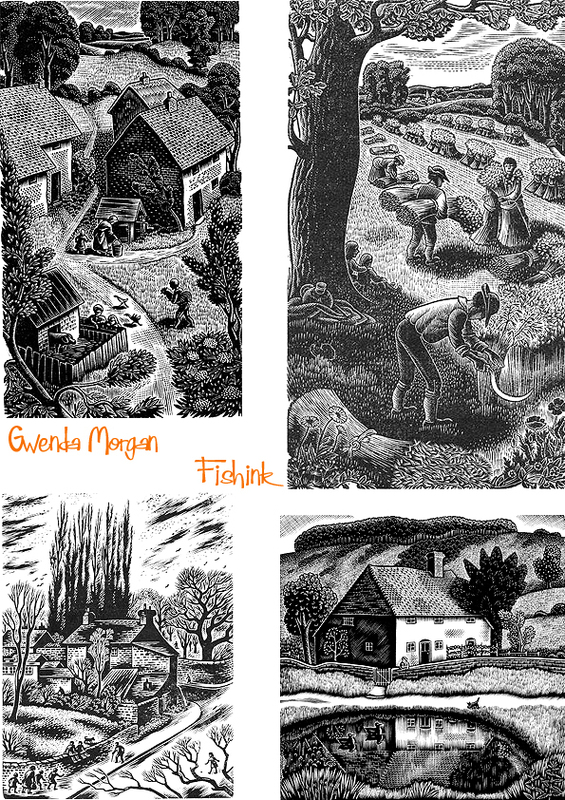 Lovely depictions of rural lifestyles at that time. Hi everyone, wow what a busy week this is turning out to be, so much so that I completely missed my chance to post out on the last two mornings so here we have a Wednesday post instead. I hope you’re all well and enjoying the pre-holiday rush! 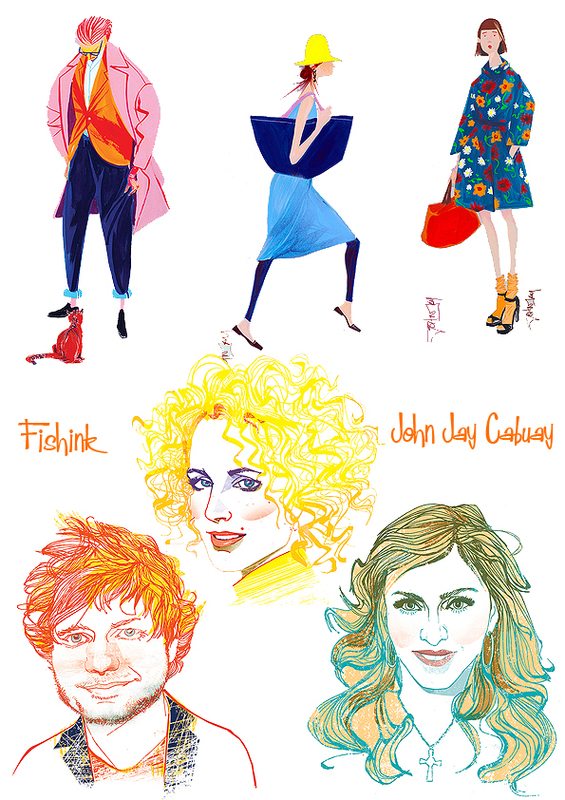 John Jay Cabuay is a New York City illustrator. 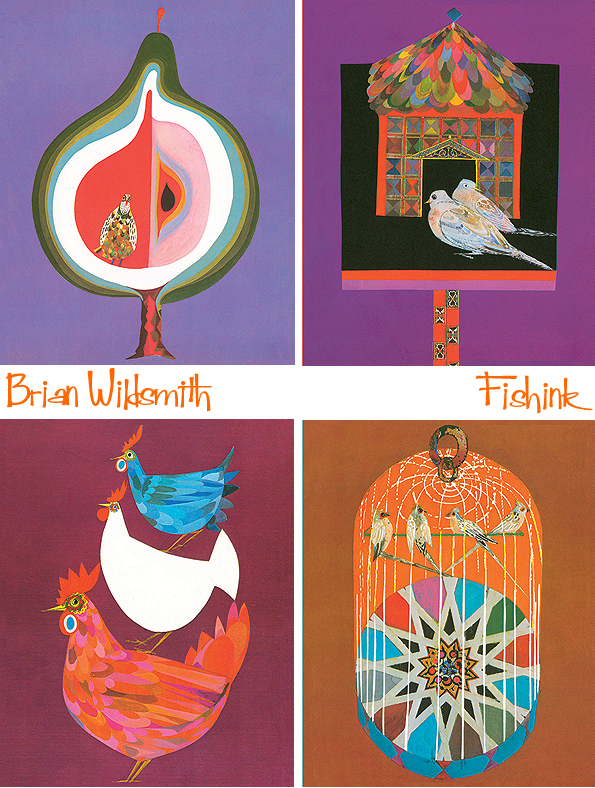 He has a beautiful sixties feel to his work, but with a contemporary twist. 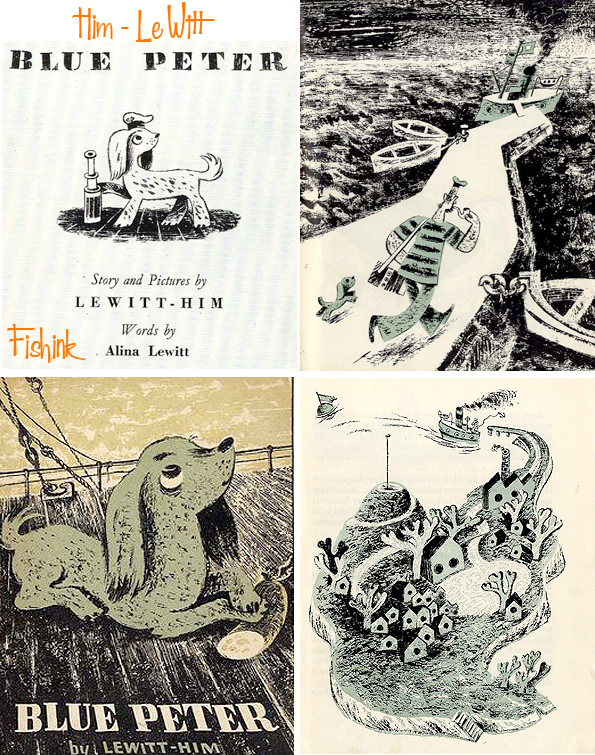 His illustrations have graced the covers of newspapers, magazines, and book jackets worldwide. 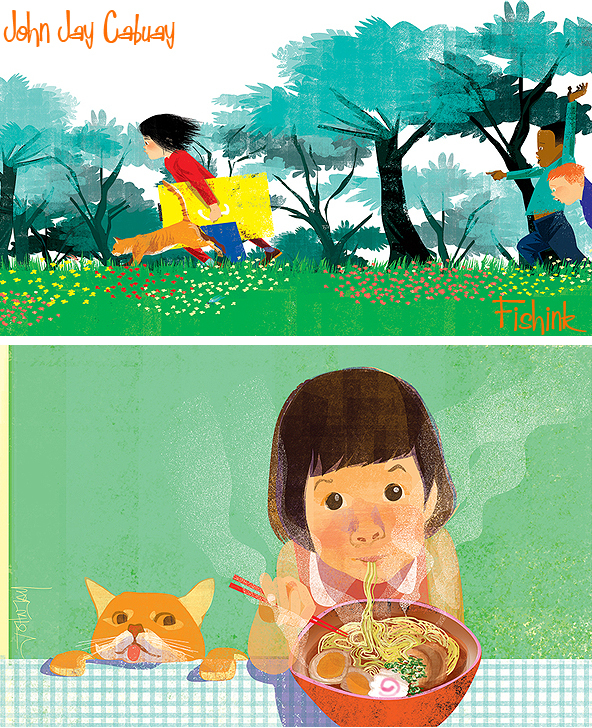 His work also encompasses illustration for children. 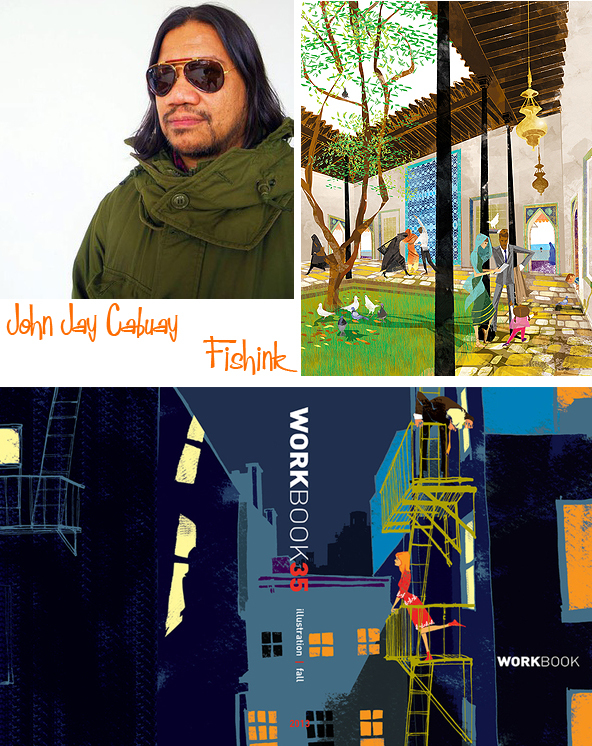 He was featured in a book by Taschen called “100 illustrators” a book about the 100 important illustrators around the globe. Stunning work, what do you think readers ? Having met in a Warsaw café in 1933, two Polish-born artists Jan Le Witt and George Him, built upon a friendship to become the highly successful collaborative design partnership Lewitt-Him. 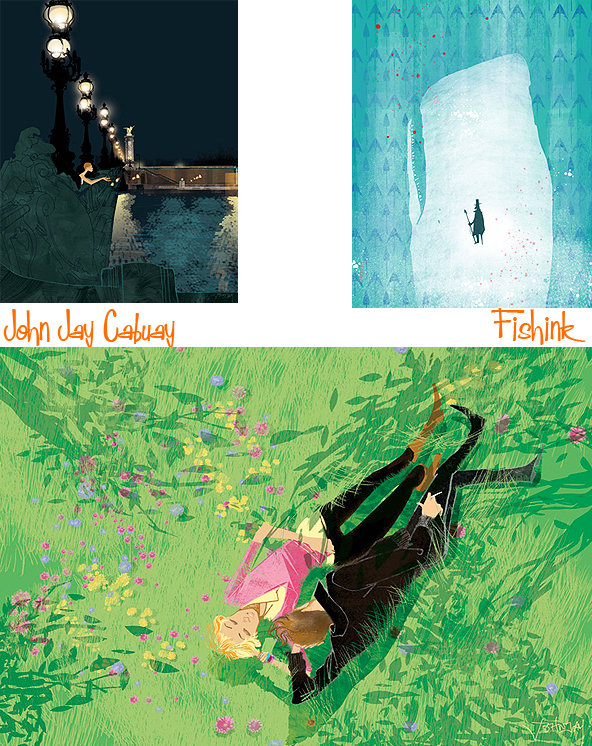 It’s so difficult to accurately say which partner created what, so I’ve created this post for both artists, working together. George Him was born Jerzy Himmelfarb in 1900 to a Polish-Jewish family in Lodz, Poland. After schooling and further education in Warsaw Him studied Roman Law in Moscow but left in 1917 when the Russian Revolution forced the closure of the university he was attending. He moved to Bonn and by 1924 had completed a PhD at the University of Bonn on the comparative history of religions before deciding to study graphic art in Leipzig. George studied at the Leipzig Academy of Graphic Art but even before he graduated in 1928, he was already undertaking commercial commissions. 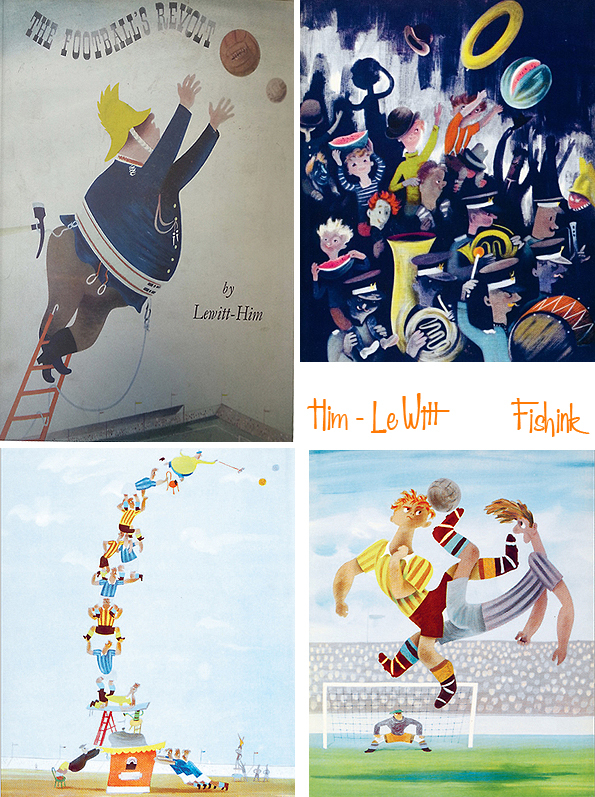 He returned to Poland where, in 1933, he changed his name and also established a design partnership with Jan Le Witt. Working as Lewitt-Him, the two established a distinctive design style which combined cubist and surrealist elements, often in a humorous context. 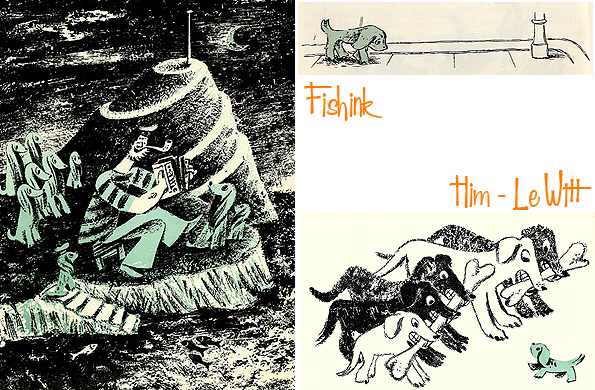 Their most notable work in Poland were illustrations for an experimental poetry group known as Skamander. 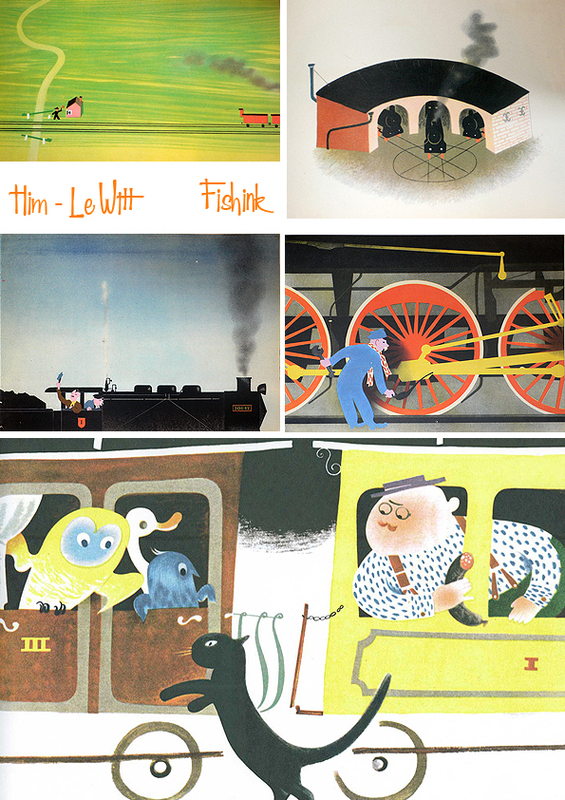 The first work that brought the team success was the 1934 graphic presentation of three poems by Julian Tuwim: “Locomotives”, “Rzepka” and “Bird radio”. 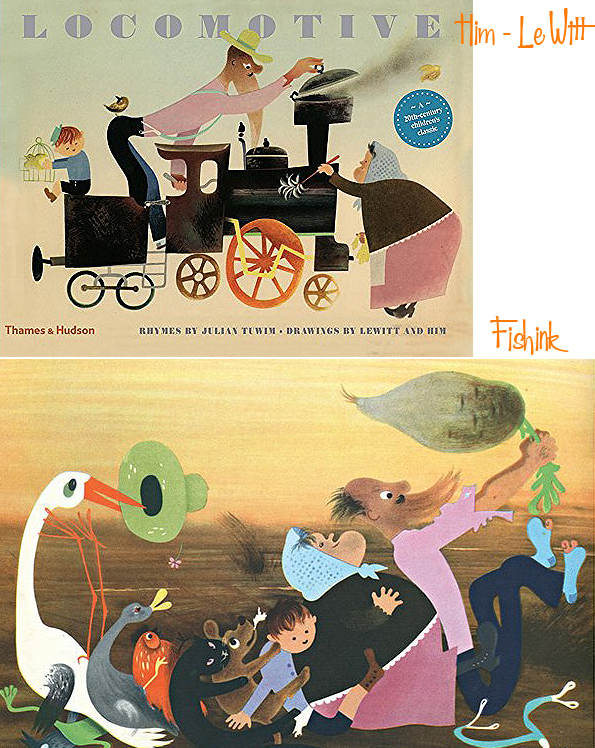 This book was reprinted several times and also appeared in translation to French and English. 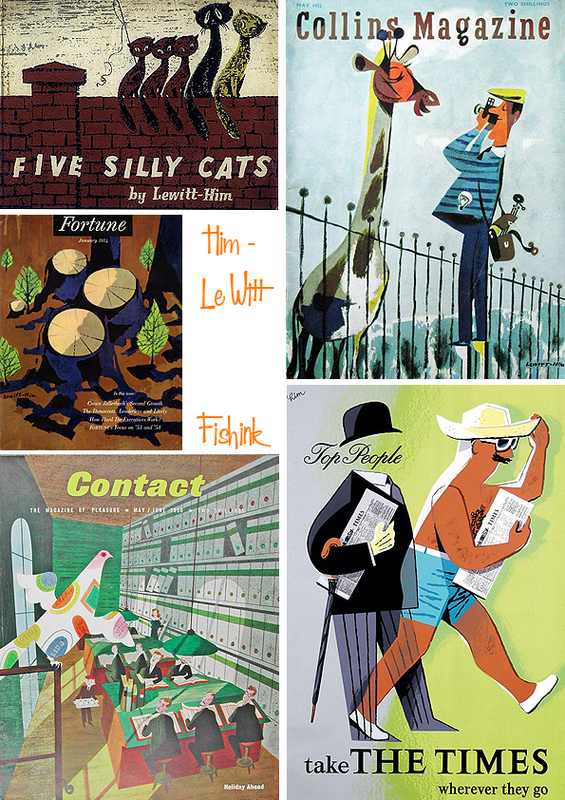 Him and Le Witt worked together in Poland for several years before, in 1937, they relocated the Lewitt-Him design business to London, following an exhibition of their work there by the publishers Lund Humphries. 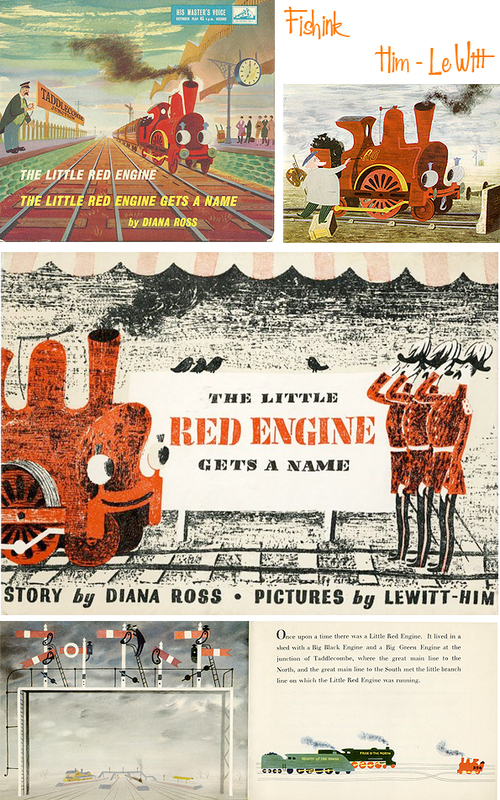 The pair quickly gained commercial contracts with London Transport and Imperial Airways as well as illustrating children’s books, such as The Little Red Engine Gets a Name (1942) by Diana Ross. They settled here and soon found that they were among a growing number of talented artistic emigres. 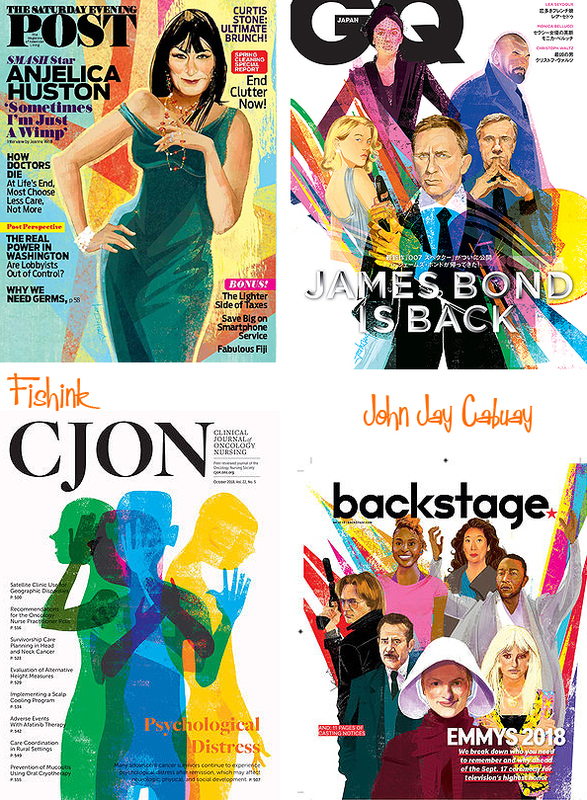 George continued his practice as freelance designer and design consultant, active in all fields of graphic design, publicity, exhibitions, corporate identity, book design etc. 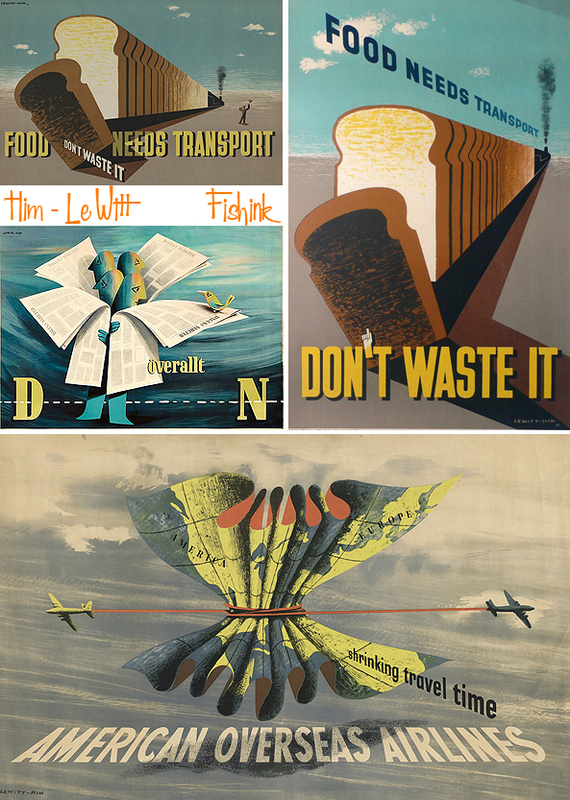 In London during World War II the partnership received notable commissions for information and public safety posters from, among others, the General Post Office, the Royal Society for the Prevention of Accidents and the Ministry of Information. George was naturalized as a British citizen in 1948 and the Lewitt-Him partnership enjoyed great success. The Lewitt-Him partnership was dissolved in 1954, when Jan decided to focus on developing his abstract paintings and artworks. George continued to work as a commercial designer. 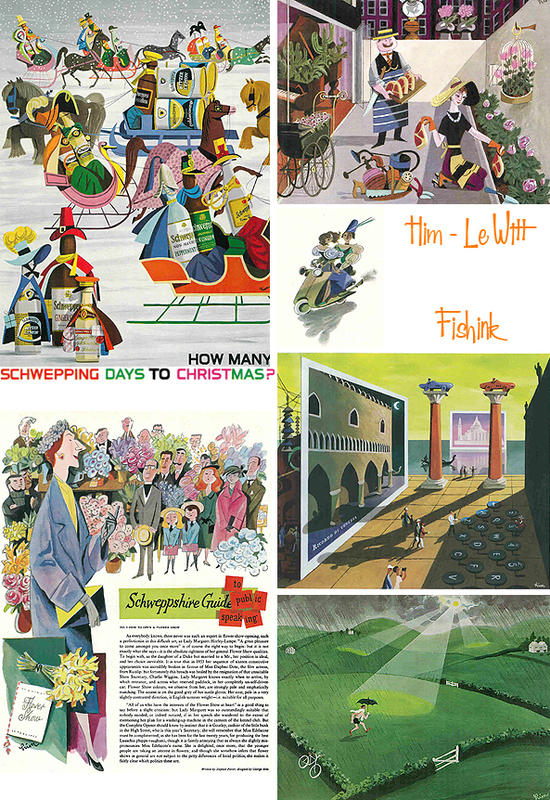 Among the advertising campaigns he illustrated was the 1950’s Schweppeshire campaign for the Schweppes drinks company. 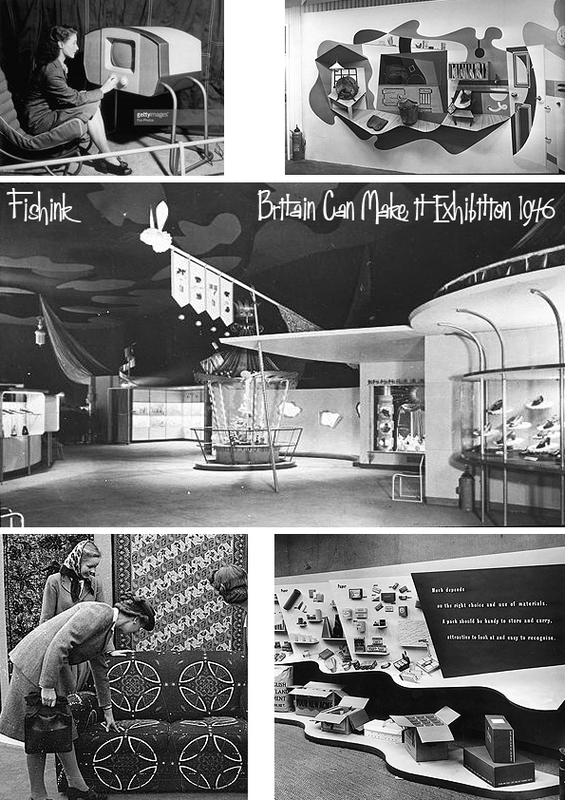 He also designed the point of sale merchandise to be used in the shops. 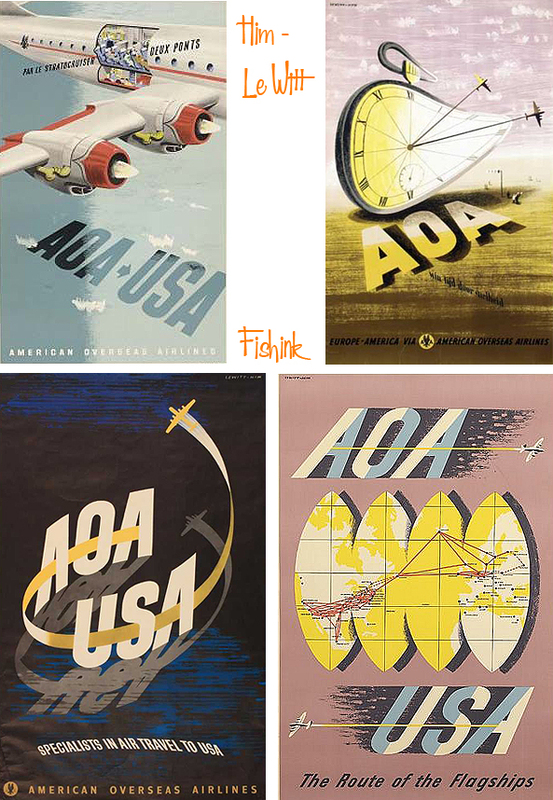 His other clients numbered several airlines, including Pan-American Airways, El Al and American Overseas Airlines plus the publishers of Punch and Penguin Books. 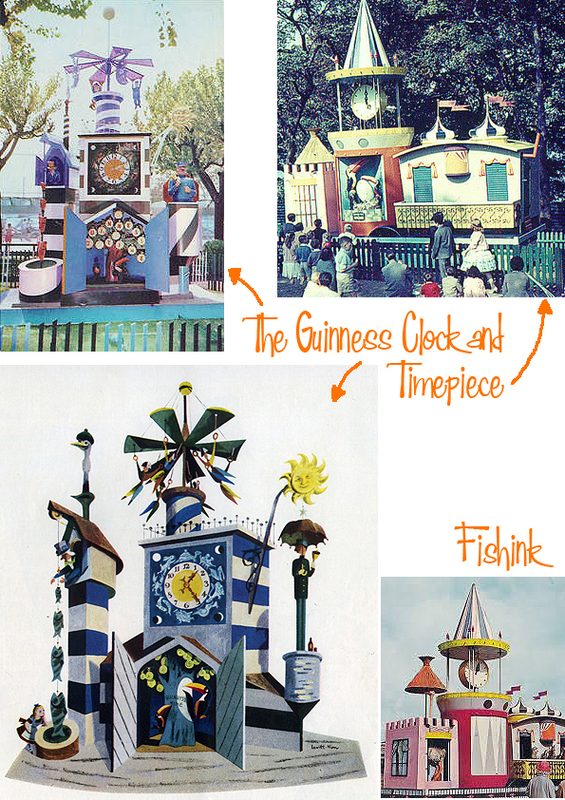 He continued to illustrate books but also designed exhibition stands, such as the Australia stand at the 1960 Ideal Home Exhibition and large window displays, notably for the De Bijenkorf store in Rotterdam and the 1961 Christmas windows for the Design Centre in London. From 1969 until 1977, Him taught graphic design at Leicester Polytechnic. Him was an active artist up until the very end of his life. 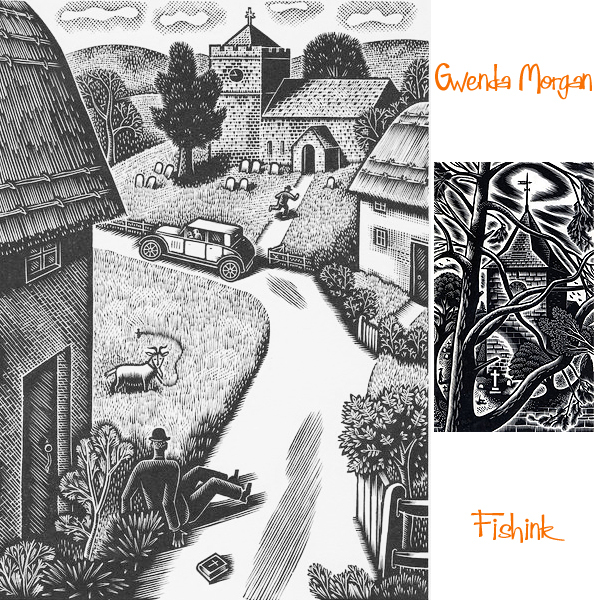 Two retrospective exhibitions of his work have been held, one in 1976 at the London College of Printing and another in 1978 at the Ben Uri Gallery in London. 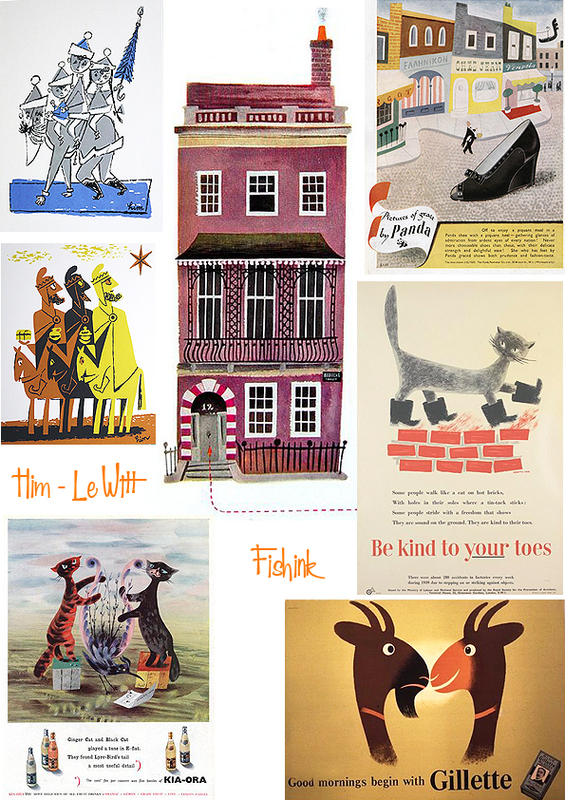 In 1977 Him was awarded the Francis Williams Book Illustration Award and in 1978 became a Royal Designer for Industry. 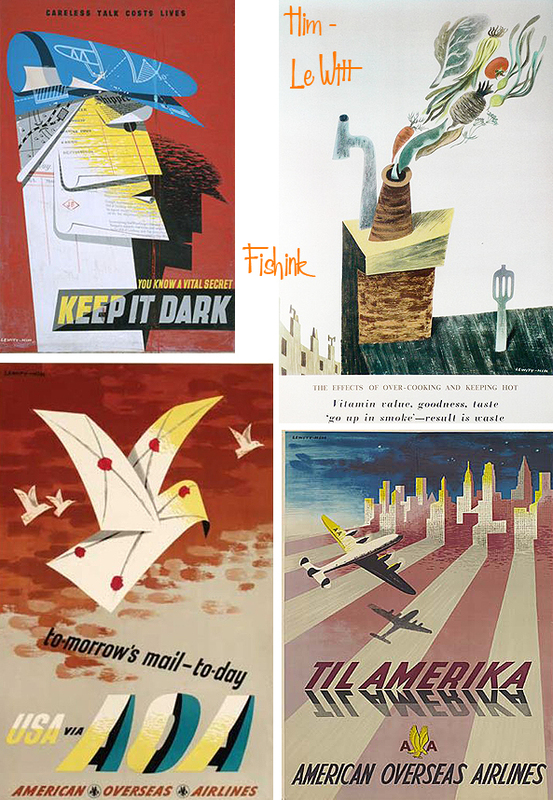 Jan Le Witt (1907–1991) was a Polish-born British abstract artist, graphic designer and illustrator. He had a long professional partnership with George Him. As a design company, Lewitt-Him brought an innovative use of colour, abstraction and symbolism to commercial design. 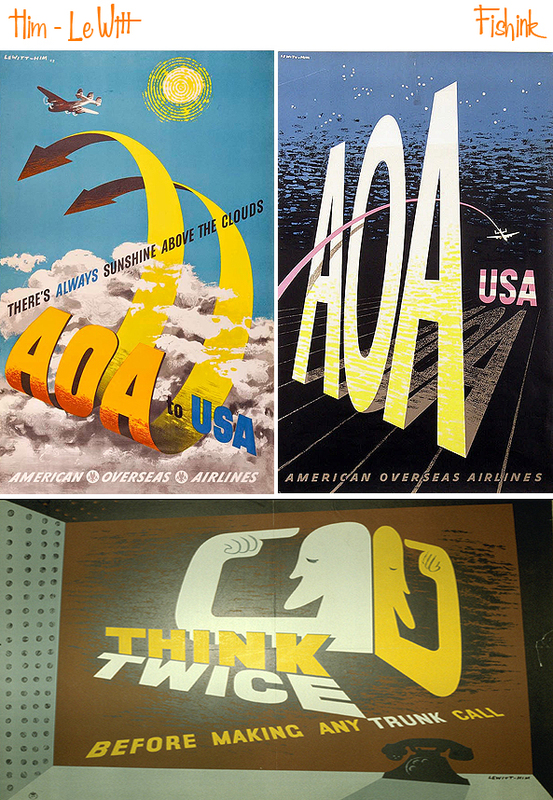 They established a reputation for fine poster work during World War Two and for exhibition displays. 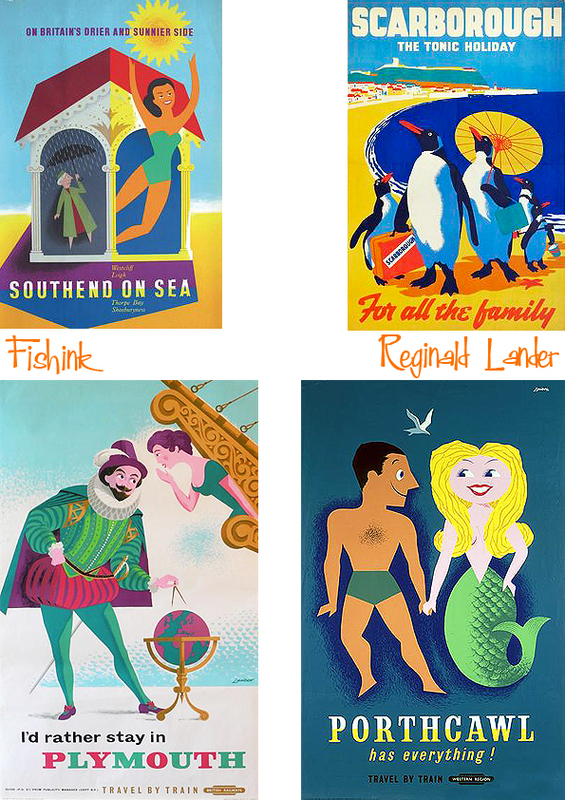 After the partnership Jan, who had become a British citizen in 1947, abandoned graphic design to work with Sadler’s Wells Ballet, creating sets and costumes for their performances. A wonderful collaboration that lasted over 20 years. What do you think readers ? 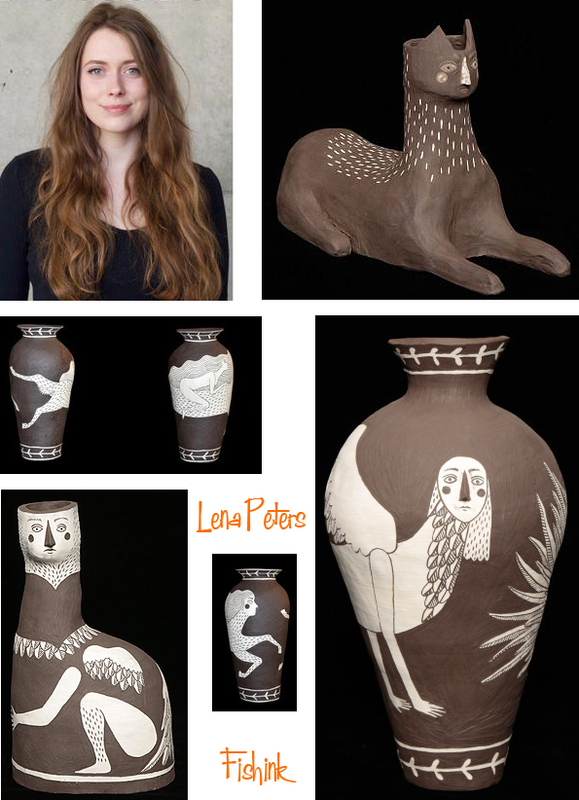 Last years UK Young Artist of the Year Award winner Lena Peters, has combined her love of ceramics with storytelling. 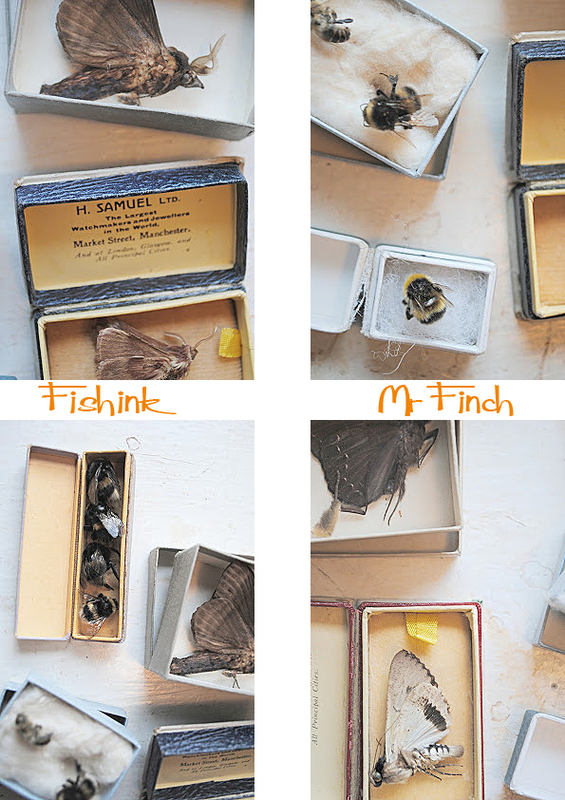 She cleverly interweaves her passion for history and nature. These elements merge with her interest in folklore and mythology making her work dance between the real and the unreal, creating illustrative objects which work to embody a narrative. 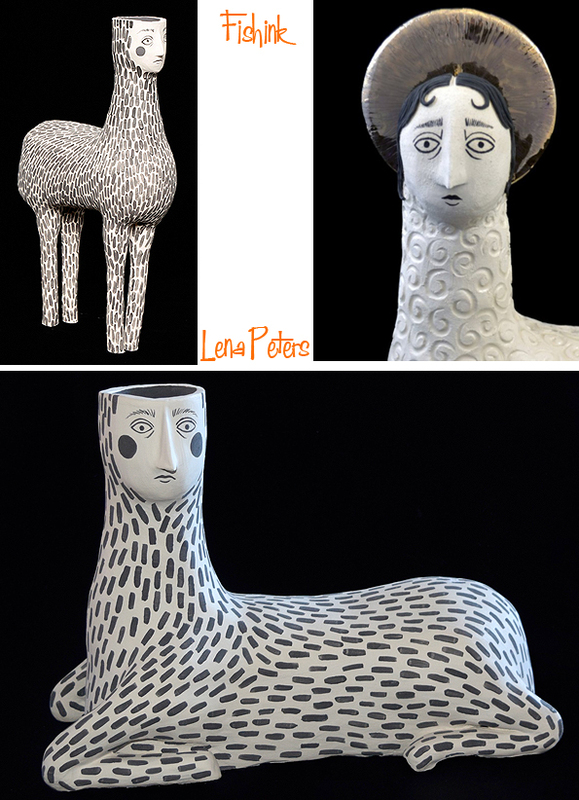 Lena’s has a fascination with the British Museum and grew up near Sheffield in the Peak District, surrounded by tales of magic and woodland sprites. 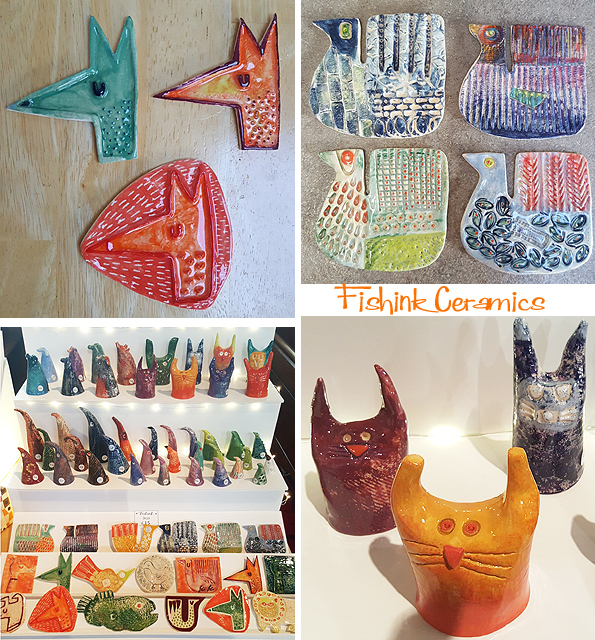 You can see where her interest in creating her ceramic creatures has come from. I love the coiled pots and bold imagery that has been formed by scraping away one layer of coloured slip to reveal the colour beneath. 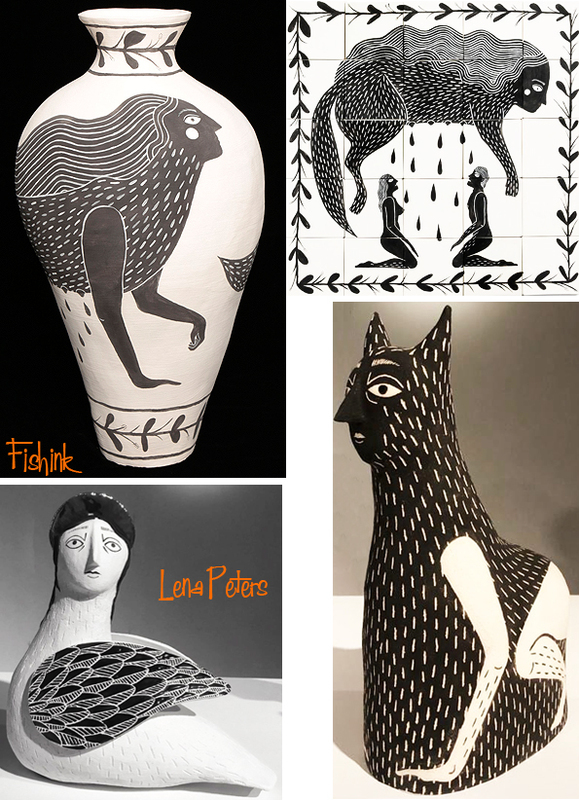 There’s an exhibition on of Lena’s work called ‘Saints and Spirits’ between 21st November – 21st December 2018 at the David Gill Gallery, 2-4 King Street, London, SW1Y 6QP. Drop in and enjoy.